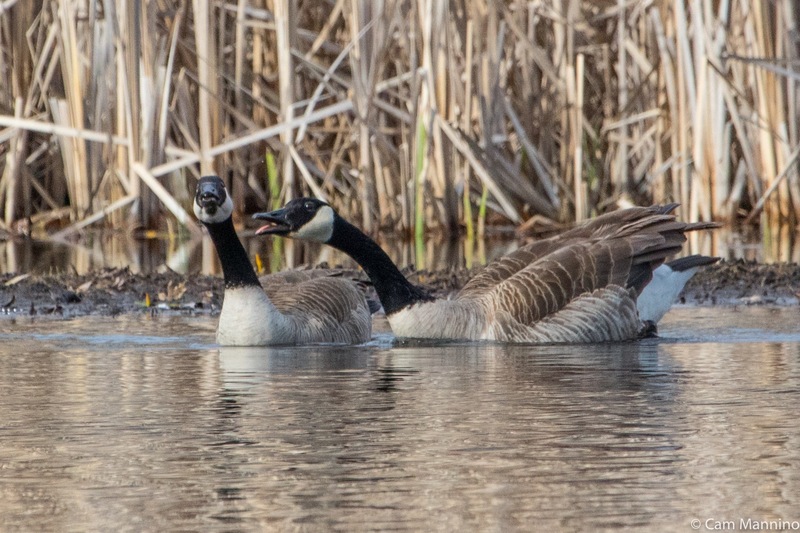 Cranberry Lake Park: Golden Meadows Host Migrators…and Last Minute Mating! Goldenrod! 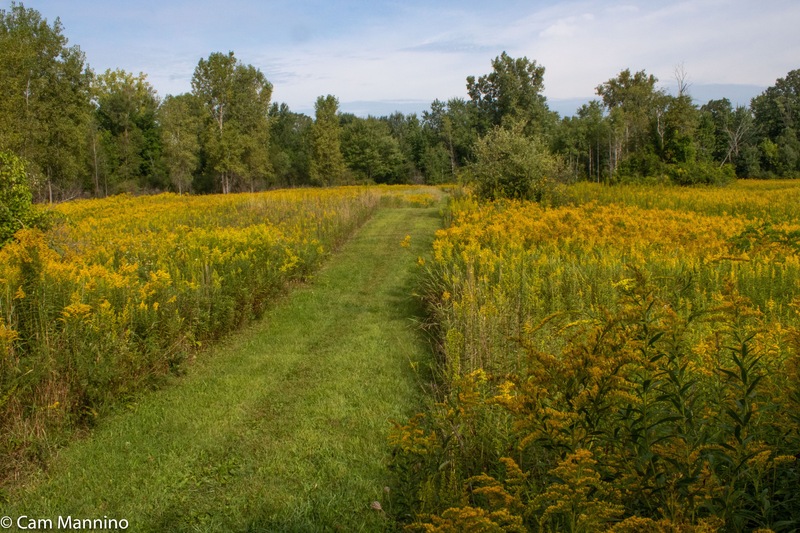 A variety of different Goldenrods gild Cranberry Lake Park in early autumn. 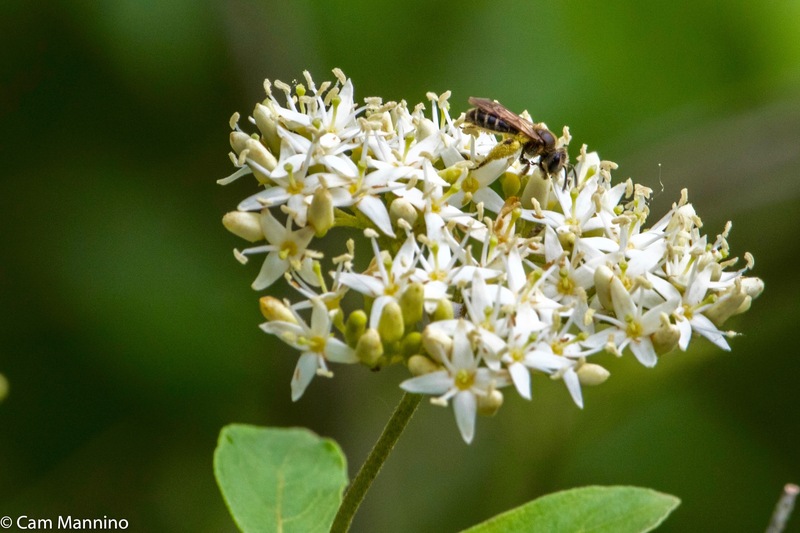 Their bounty of nectar and pollen and the insects they attract make Cranberry Lake an ideal stopover for migrating birds and butterflies as they prepare for their long journeys. So cheer for Goldenrods as they feed wildlife, but don’t blame them for your fall allergies – blame ragweed! Year ’round birds and summer residents have almost finished molting and are also stocking up energy for winter or the migration. And a surprising number of insects are also preparing by busily mating one last time, leaving behind eggs or chrysalises that can bring forth young next spring and summer. Lots going on within this carpet of gold! Now’s the time to train your binoculars on any shaking leaf you see. It might be a fall migrator! 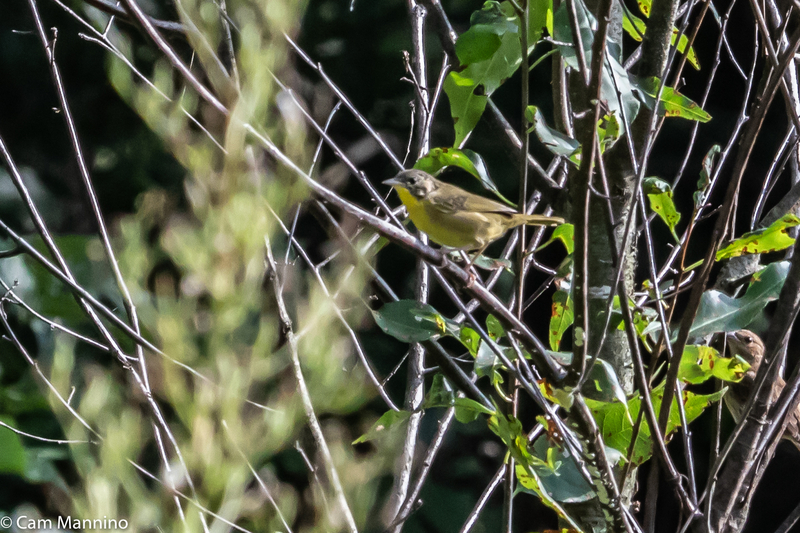 Colorful, tiny warblers and vireos that are just passing through on their way south are well worth a pause to look into the shrubbery, as you’ll see below! But don’t forget to wish “bon voyage” to the migrators who arrived last spring and sojourned with us all summer. Many are finishing up their molts and readying for long journeys to the southern US or even Central and South America. 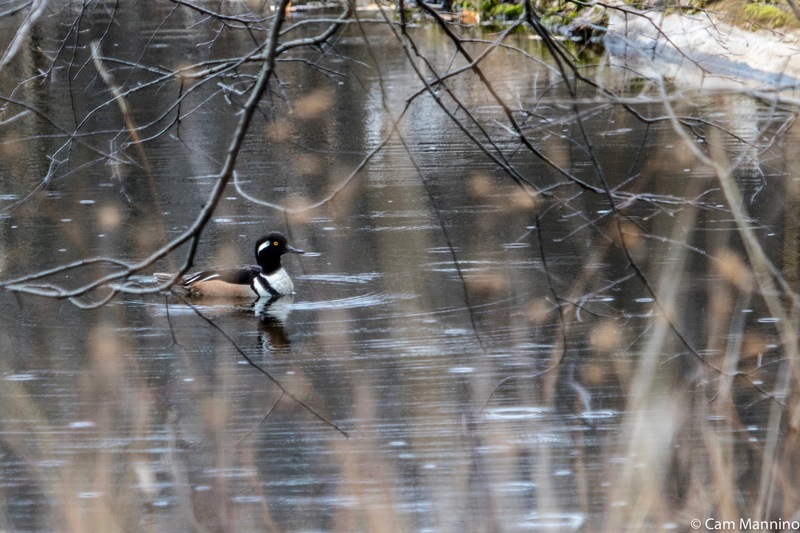 We saw all of the birds shown below on the bird walk last week at Cranberry Lake Park. The trees are aquiver with fall migrators, travelers that bred up north and only briefly stop to rest and refuel around our woods and meadows. The most colorful ones that we often hear but can’t see are warblers and vireos. These little birds travel on the night wind because it’s safer. Hawks, eagles, and other birds that might see these small birds as food migrate during the day so that they can ride the thermals! My camera and I are not quite quick enough to catch a lot of these tiny, fast-moving birds. So to share them with you, I’m relying on photos of other photographers with the skills, equipment and sometimes sheer luck to capture these little beauties! 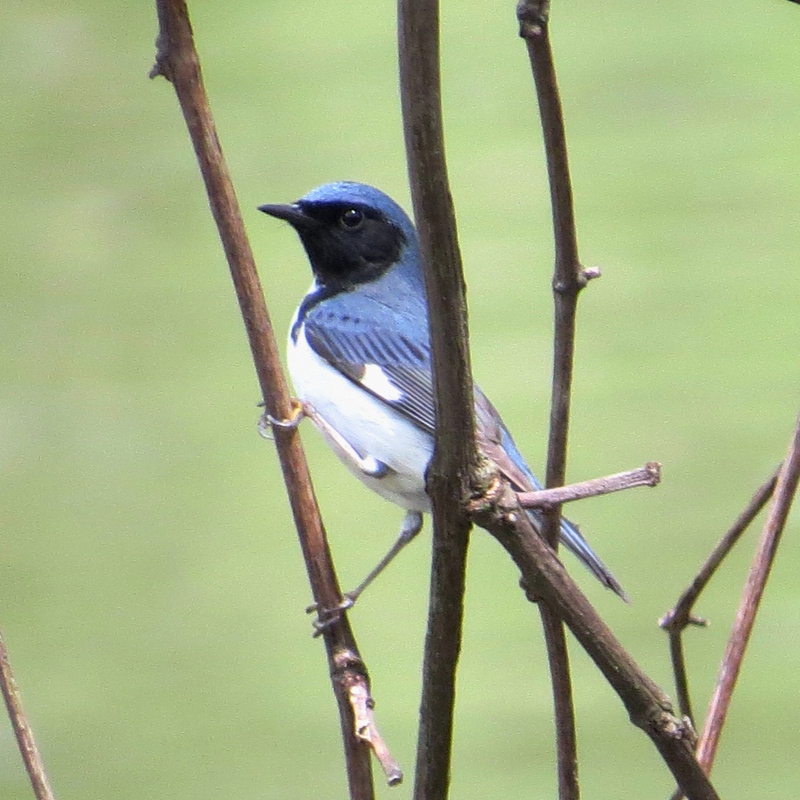 This photo of the striking Black-throated Blue Warbler (Setophaga caerulescens) is by gifted iNaturalist photographer Jeff Skrent at iNaturalist.org. 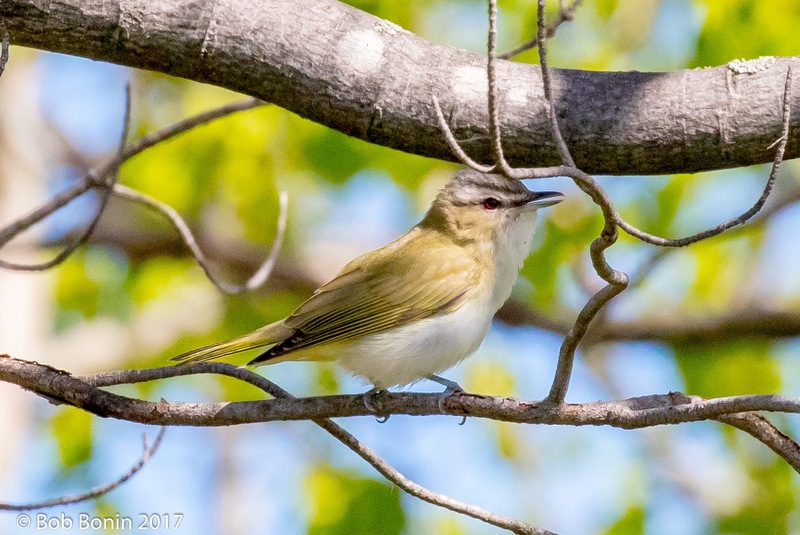 A Yellow-throated Vireo ( Vireo flavifrons) from another generous iNaturalist photographer who uses the single name, paloma. 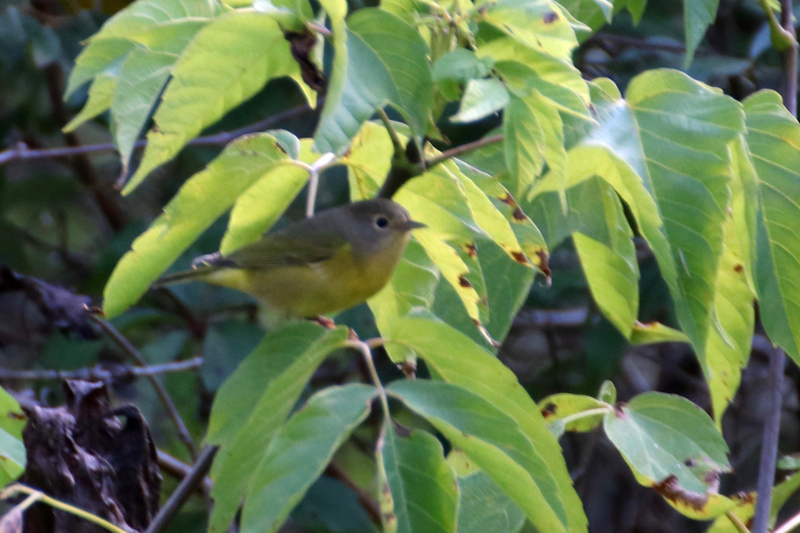 A Nashville Warbler (Leiothlypis ruficapilla) was also too quick for me. But here’s one I did manage to catch as it passed through in the autumn of 2016 on its way to Central America. Some avian migrators see our parks as a great place to raise their young, so they come in the spring and stay for the summer. Having finished breeding and molting, they are now preparing to leave for points south. The male Common Yellowthroat’s (Geothlypis trichas) “Witchedy – witchedy” song accompanied me often during the summer months as he and his mate raised their young. But you may here his “chuck” call as he hops among the branches stocking up on insect protein before leaving for Florida. The Common Yellowthroat stops singing its “witchedy-witchedy” song in the fall and prepares to migrate. Both the male Common Yellowthroat and his mate did a complete molt in July or August and now have fresh feathers for the trip. She’s bit more secretive than the male as she feeds on beetles, ants, bees (! ), dragonflies and grasshoppers within the golden fields. Usually she’ll leave a week or two later than the male. 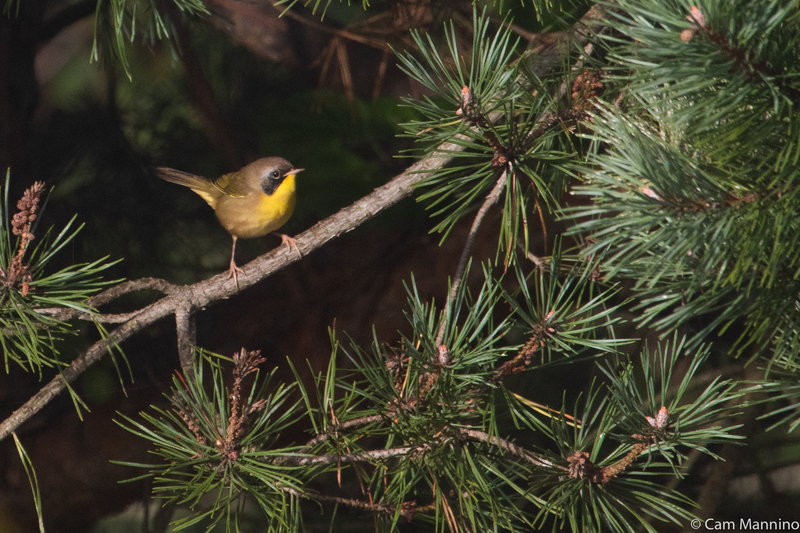 The female Common Yellowthroat will be around a bit longer than her mate. 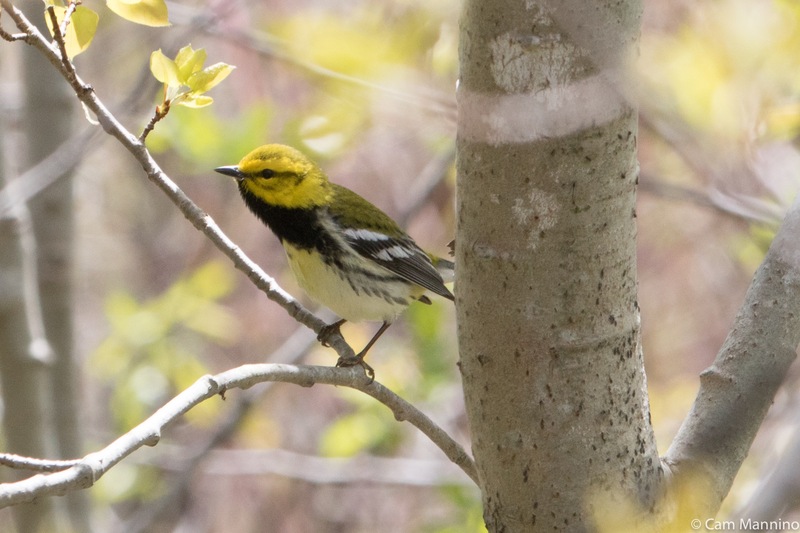 Last spring the Wednesday morning birders heard a Black-throated Green Warbler (Setophaga virens) singing its mating song along the Hickory Lane at Cranberry Lake. And this week, the birders spotted one flitting high in the trees. Perhaps it nested here to raise its young, or it could be just passing through our parks in spring and fall. Here’s a photo I took of a male during the spring migration this year. The Black-throated Green Warbler may have nested here this summer or he may be just passing through both in the spring and fall. High in a snag, a Cedar Waxwing (Bombycilla cedrorum) paused briefly to survey the golden eastern meadow one afternoon. Many waxwings go into lower Canada to breed, but I’ve seen successful nests in our parks, too, so this one may have been a summer resident. 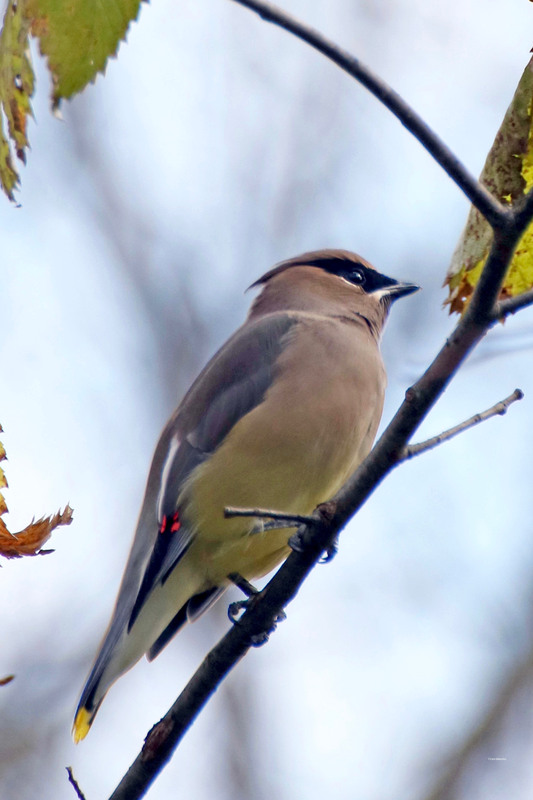 Some will move south for the winter, but many waxwings will stick around during the cold months. 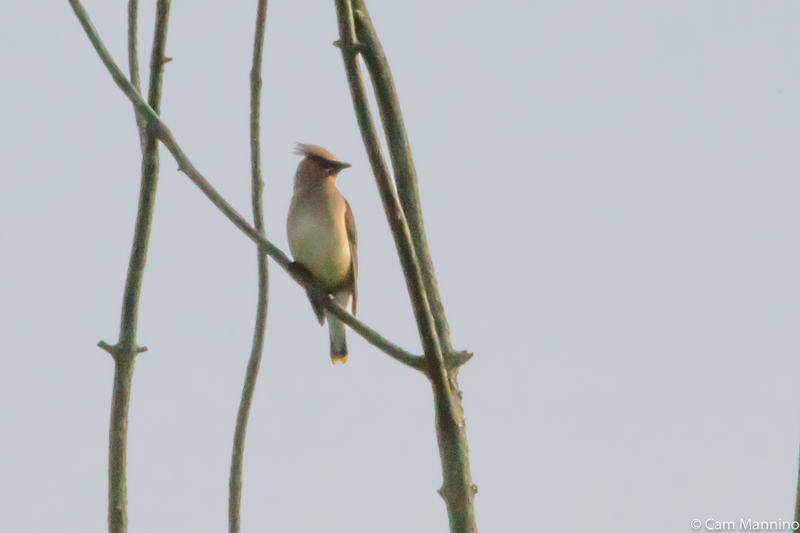 his Cedar Waxwing may have spent the summer with us or could be migrating south from Canada. 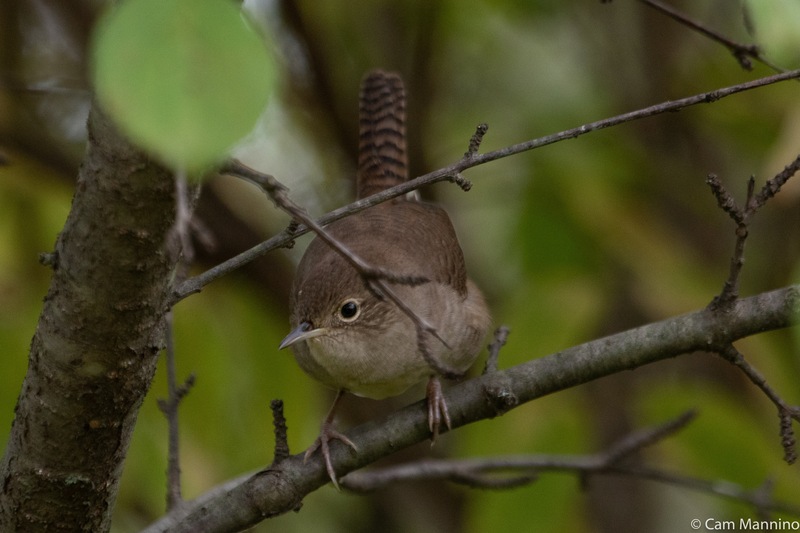 House Wrens (Troglodytes aedon) become quite secretive after breeding. But this one popped out of the greenery for a minute. It appears to have completed the late summer molt and is prepared to start south between now and mid-October. The House Wren has raised its young here, molted and will be leaving shortly for Florida and other southern states. 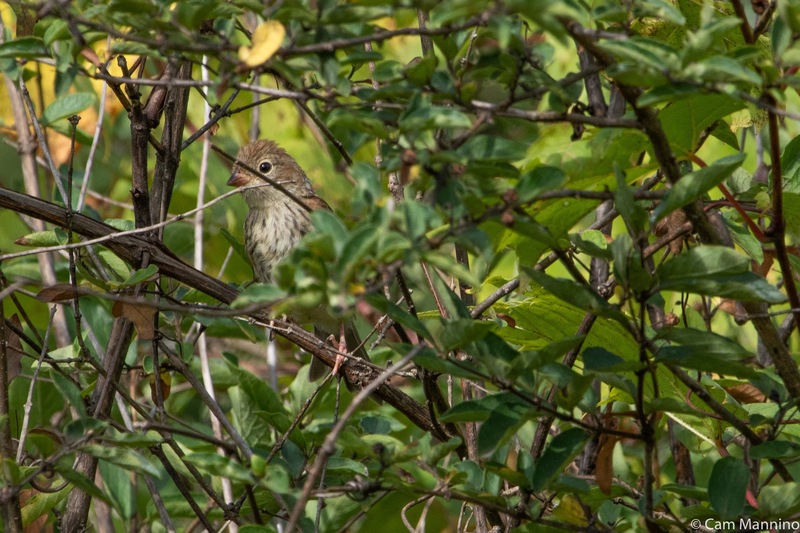 A curious juvenile Field Sparrow (Spizella pusilla) peeked at me from dense shrubbery along the trail, too. The migration of Field Sparrows is not always predictable. Some migrate, some don’t, and some migrate one year but not the next, according to the Stokes’ Guide to Bird Behavior (Vol.2). If this one does migrate, it may join a large flock with Chipping Sparrows as well as other Field Sparrows. If this Field Sparrow chooses to migrate this year, it will probably join a larger flock. Or it may just stay put! 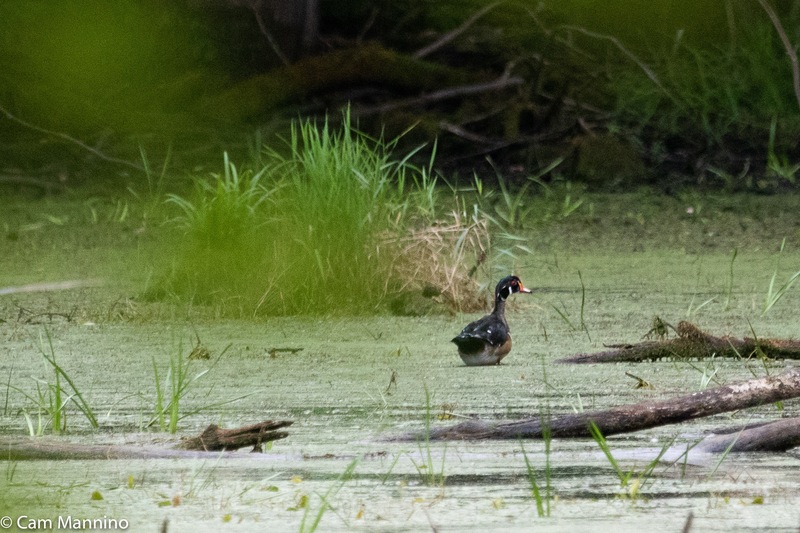 On one of my Cranberry walks, I spotted some Wood Ducks (Aix sponsa) far across a well-hidden wetland. They were males who’d chosen this secluded spot to begin their molt out of the summer “eclipse plumage” into their fancy choosing-a-mate plumage. This one looked a bit rough at the moment, but well on his way to his courting colors. As I explained in last week’s molting blog, males molt earlier in the summer to camouflage themselves as females and then molt again in the fall, a time when they compete for a mate to breed with in the spring. A male Wood Duck almost finished with the molt from his “eclipse plumage” to his courting feathers. I often hear, but rarely see, the vireos at Cranberry Lake. 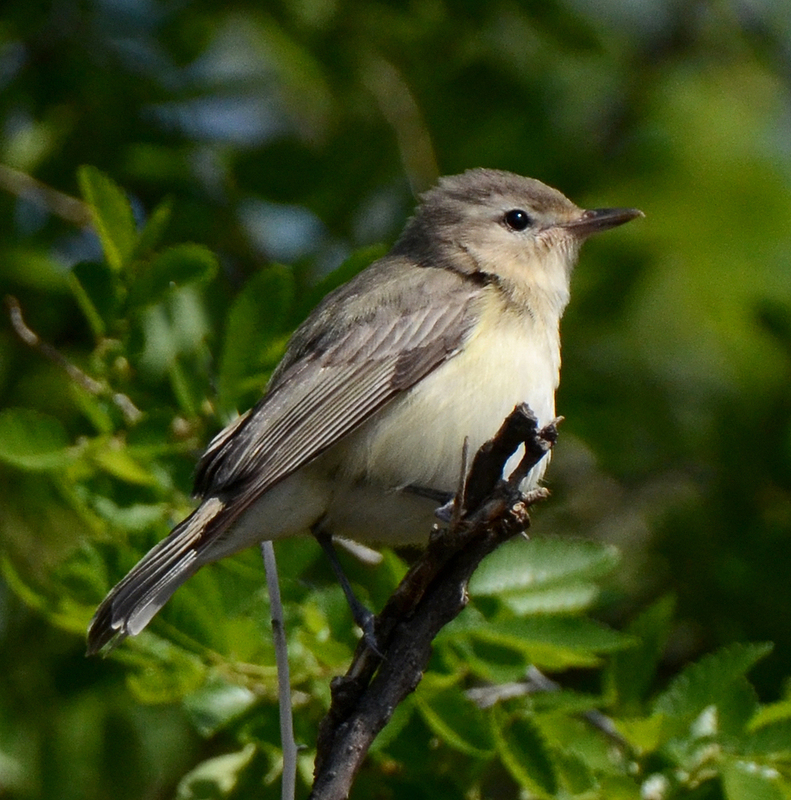 But I did get to see a Warbling Vireo (Vireo gilvus) in the spring. A rare treat, since it loves to sing high in the treetops! Its plumage is modest but its song is impressive! The birders saw one lingering in our park for a while before departing for points south. Warbling Vireos are often heard high in the trees, but not as commonly seen. Occasionally I get a quick look at a Red-eyed Vireo (Vireo olivaceus). But Bob Bonin, Joan’s husband and another gifted photographer, got a much better photo than I have so far! This week it too was hanging out with other migrators. Birds, of course, are not the only creatures migrating through our parks this autumn. Monarch Butterflies (Danaus plexippus) fluttered everywhere at Cranberry Lake Park in the last few weeks. 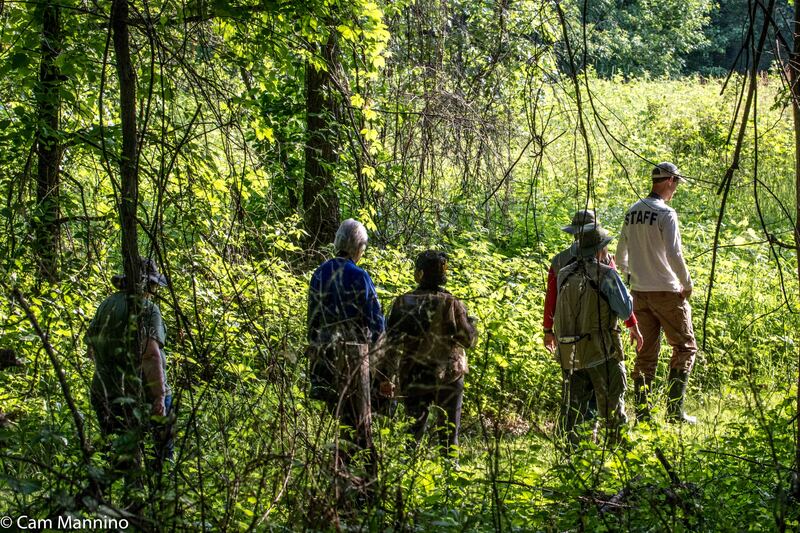 This “super-generation” of fragile creatures – the ones that will fly 3,000 miles to Mexico – were swooping and diving over the meadows at Cranberry Lake, feeding on the acres of Goldenrod. So glad that we provide these master migrators with such a feast! 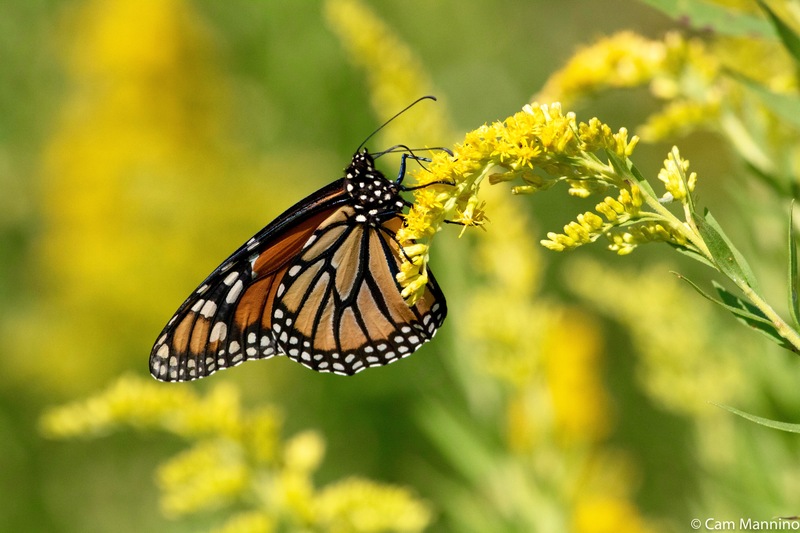 A female Monarch using it proboscis like a straw to sip nectar from Canada Goldenrod. 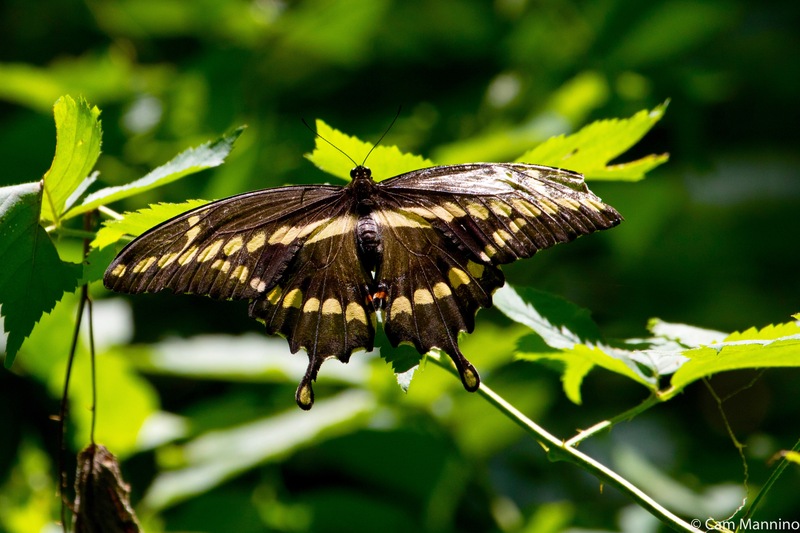 The tattered Giant Swallowtail (Papilio cresphontes) below looks lightly worn. 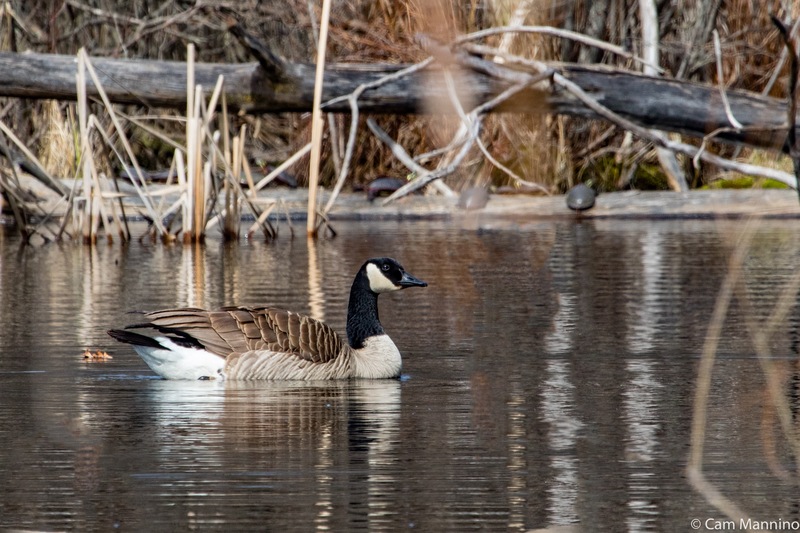 Let’s hope that attests to its having mated here this summer after its migration to Cranberry Lake. These huge butterflies seem to be expanding their range north. Possibly due to climate change, Michigan now often has frost-free Septembers. So if mating was successful, the caterpillars of this very large butterfly may survive inside their chrysalises and hatch in our parks next spring. This Giant Swallowtail looks a bit tattered at the end of a summer at Cranberry Lake Park. Due to mating? Maybe. Among the Goldenrod, insects seek out mates in a last ditch effort to leave offspring for next summer. 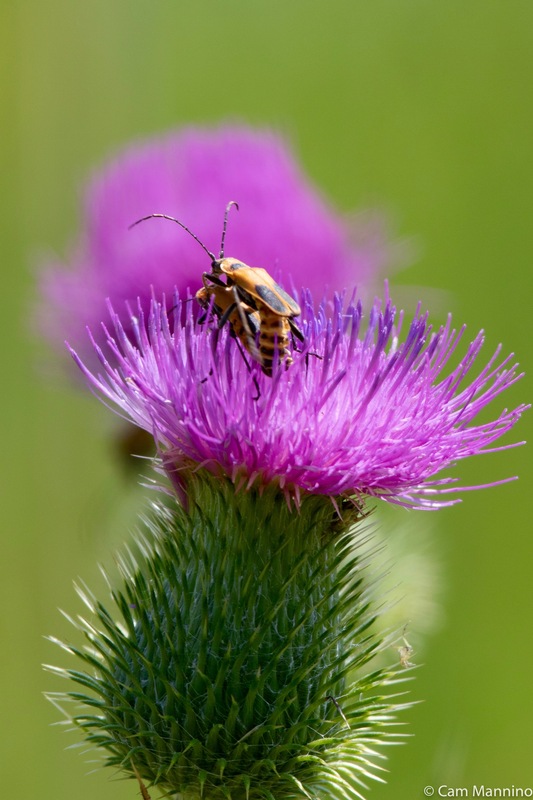 A pair of Goldenrod Soldier Beetles (Chauliognathus pennsylvanicus) rendezvoused on a Bull Thistle (Cirsium vulgare) – a potentially risky place to mate since a bird might think they make a tasty contrast against the blossom! A pair of tiny Pearl Crescent butterflies (Phyciodes tharos) also decided that a warm September afternoon provided the ideal time for mating. 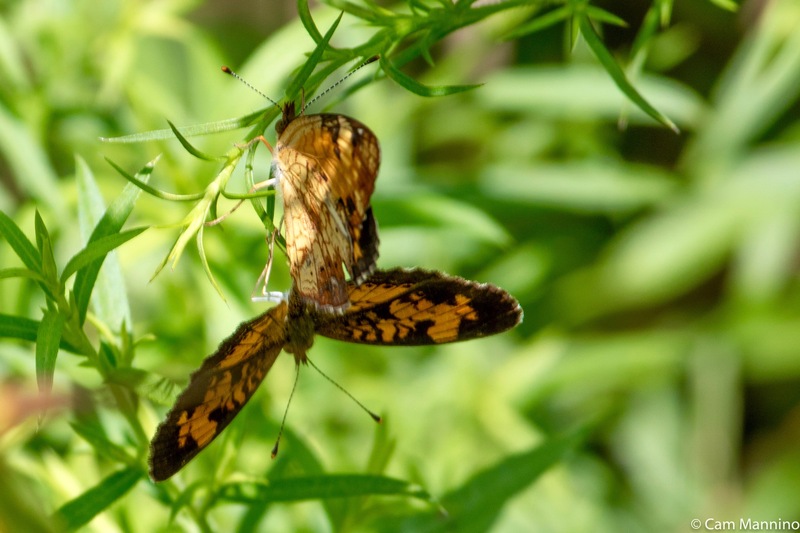 A pair of Pearl Crescent butterflies mating in eastern meadow at Cranberry Lake Park. And two Ladybugs chased around a Goldenrod stem, one frenetically holding on to the other. I couldn’t really determine whether they were mating or fighting! Clearly, one was more interested in escape and one was in hot pursuit. They were moving too fast for a great shot or a definite identification. My guess is that they were the invasive Asian Ladybugs (Harmonia axyridis). Unfortunately they are more common these days than our native Nine-spotted Ladybug (Coccinella novemnotata) and come in highly variable colors and patterns. 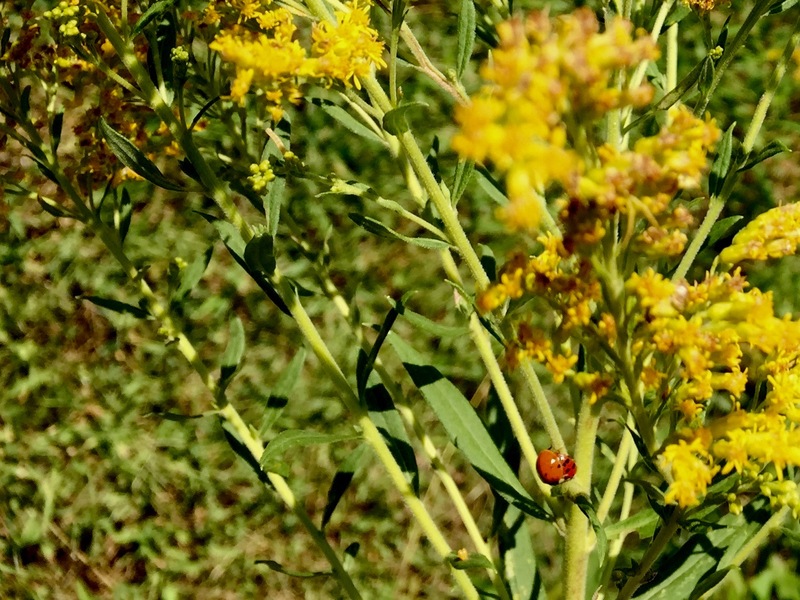 Two ladybugs chased each other around a Goldenrod stem – mating or aggression? 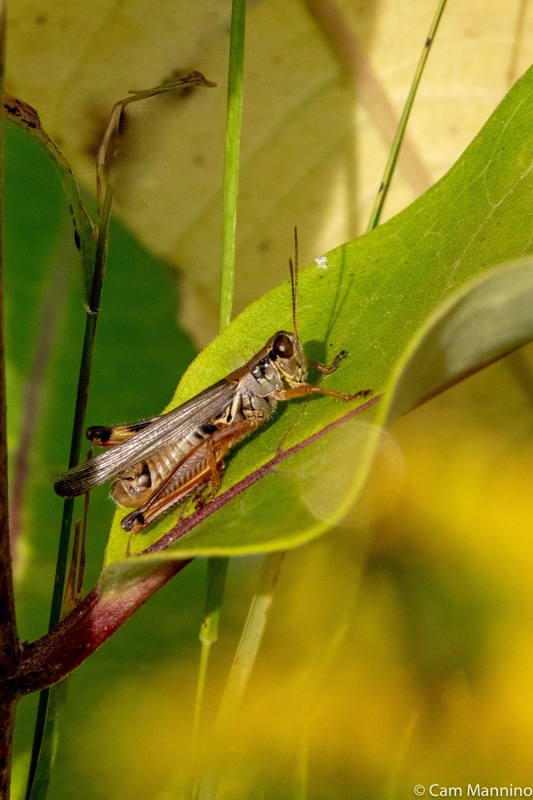 This tiny Red-legged Grasshopper (Melanoplus femurrubrum) had probably spent the night near the stalk of the Common Milkweed (Asclepias syriaca), wisely hidden from predators among its withering leaves. It will molt multiple times before mating and leaving eggs in the soil to emerge next summer. A Red-legged grasshopper nymph probably spent the night within this Common Milkweed plant. The edge of a meadow, near a wetland, might be an ideal spot for a female Great Blue Skimmmer dragonfly (Libellula vibrans). She could be spreading her wings in hope of attracting a mate. If successful, the aquatic plants nearby could host her fertilized eggs. Or while waiting for a likely male, she might just have a great perch for hunting unsuspecting prey! A female Great Blue Skimmer sunned herself on a cool morning, possibly trying to attract a mate – or just hunting for the next unwary insect! Early fall mornings are an excellent time to appreciate the art of the spiders. 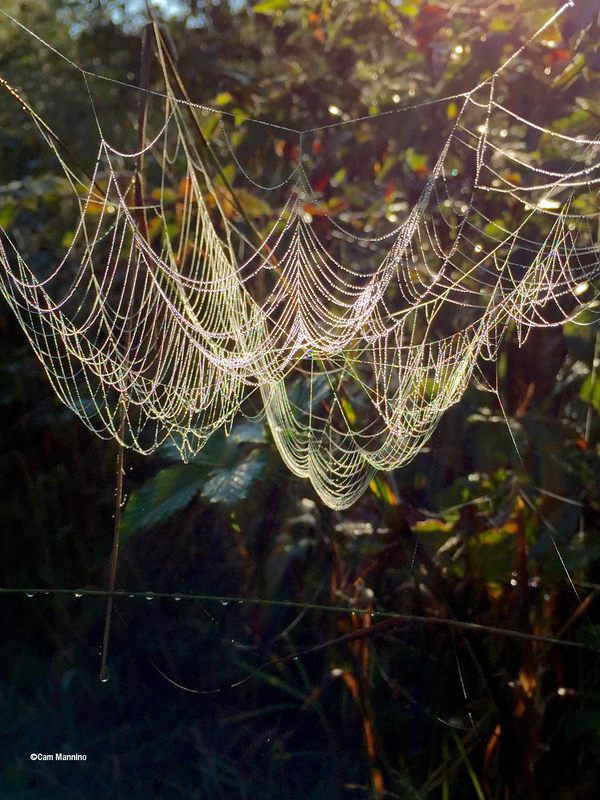 Warm days followed by cool nights leave heavy dew on spider webs, and when the sun makes them visible, they are dazzling. How about this lovely creation of an Orb Weaver spider (family Araneidae) drooping with the weight of the dew but subtly reflecting the colors of the sun’s spectrum! The sun reflecting on the dew in an Orb Weaver’s web. Another intriguing web, though not as beautiful, is cleverly constructed. The Funnel Web Spider (Circuria species) lays a sticky sheet of web across the grass, which would be difficult to see were it not for the dew. At the edge of the web, it weaves a tunnel where it lies in wait for unsuspecting prey. Above the sheet, it weaves an irregular network of silk designed to knock flying insects into its sticky net below. You can see the funnel at the back of this web below. The Funnel Web Spider’s trap for flying insects with a nifty funnel in which the spider can wait for its prey unseen. 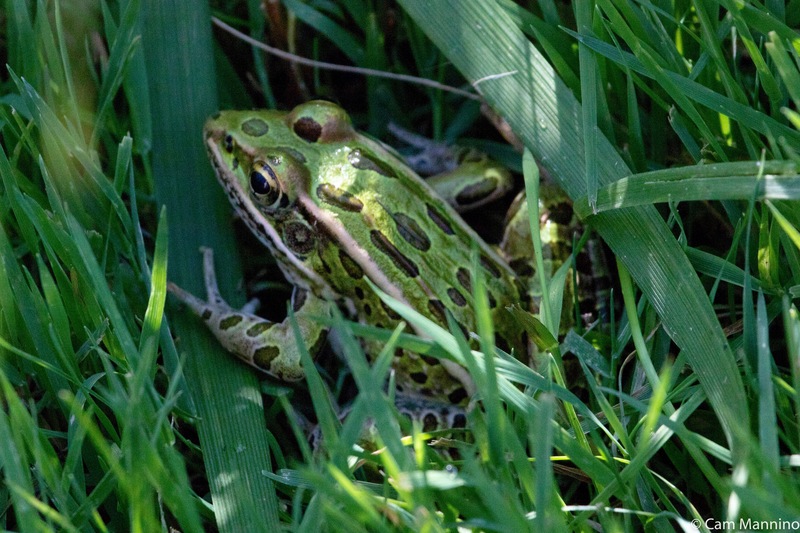 As I skirted the edge of wetlands one Sunday, it seemed that a frog sprang out of the grass at every step! Most of them were Northern Leopard Frogs (Rana pipiens), their emerald green backs covered with circular black dots outlined in pale gold. Their dark eyes encircled with gold add to their glamour. Pinkish dorsolateral ridges are another distinguishing field mark. They shine like cloisonné in the deep grass! Leopard frogs big and small sprung out of the grass near wetlands. Until last week, I’d never noticed Pickerel Frogs (Rana palustris) at Cranberry Lake. These smaller frogs have somewhat rectangular spots that line up along the frogs’ back in neat rows. They are smaller than Leopard frogs. They tend to be brown (though they are sometimes green too), so I’m fairly sure this is Pickerel frog below. Pickerel Frogs have more rectangular spots in rows down their backs, rather than the more random round spots of Leopard Frogs. So I think this is Pickerel frog, but I’m not positive! And Finally, the Native Plants that Make It All Possible! Autumn Mornings: Not To Be Missed! Mist rising in a meadow beyond the trees. 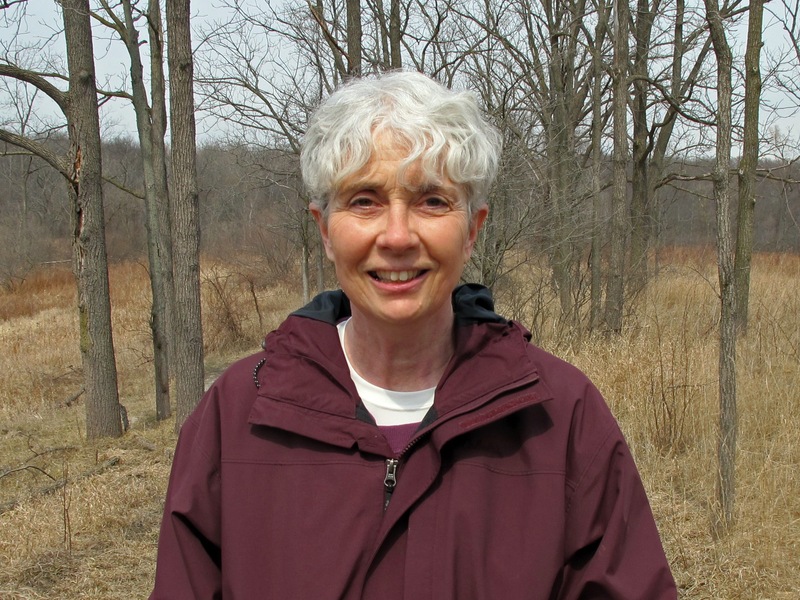 On our September bird walk at Cranberry Lake Park, we arrived on a cool fall morning. The previous day had been unseasonably warm, but a north wind sailed in overnight. 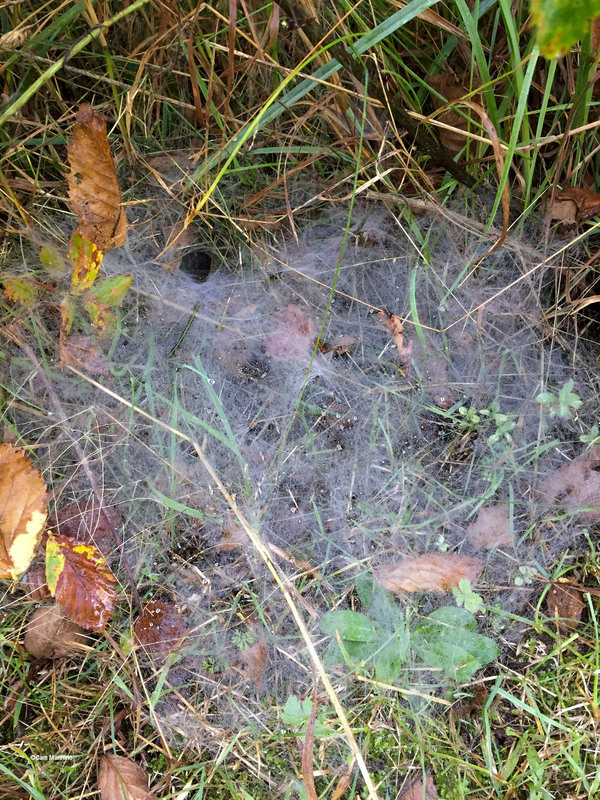 The cool air had created heavy dew, leaving silver droplets that set the spider webs shining. 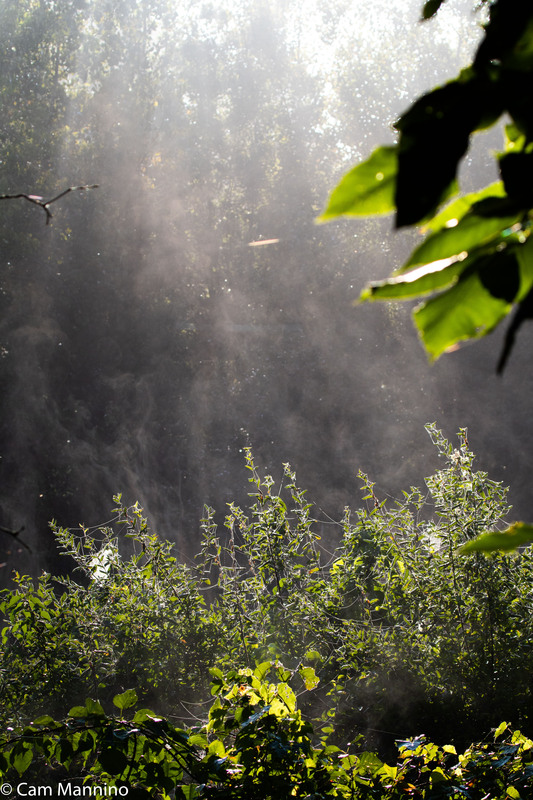 The morning sun on the moist leaves created the fine mist you see above, rising from a meadow beyond the Hickory Lane. What a sight! – the makings of future clouds floating like silver smoke above the wildflowers. A wave of migratory warblers and other small birds had arrived on that night wind. The birders watched, binoculars up, as these travelers hopped busily in the branches, feeding on the plenty of insects attracted by fields full of blooming fall wildflowers. And all of this beauty is gratuitous – unearned, just gifted to us if we just put on our shoes and head out the door! Consider escaping from the busy-ness of life for just an hour this week. Let these beautiful fall days lure you to the parks and savor the gifts that nature so generously offers to all of us. 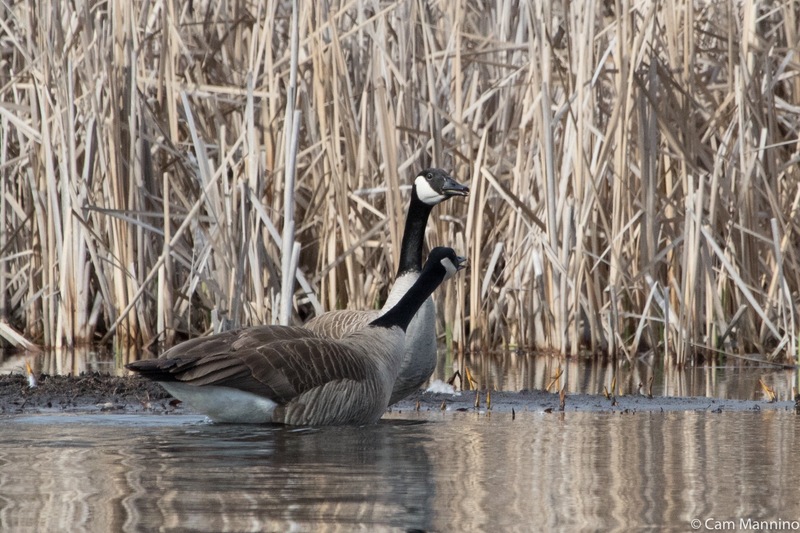 Most of the action at Lost Lake Nature Park in the last few weeks has centered around which pair of Canada Geese control which section of the lake. These normally mild-mannered birds can act like a flock of drama queens when establishing territory and nesting. When I arrived for the first time two weeks ago, the weather was still cold, but some geese tempers were simmering! I’d just read The Geese of Beaver Bog by Bernd Heinrich and supplemented my limited Canada Goose knowledge with Donald Stokes’ Guide to Bird Behavior, Volume 1 – so I was curious to see if I could read Canada Goose body language for the first time. Well, it was quite an exciting set of lessons from the geese themselves! Then I went on to explore the more mellow residents of Lost Lake Nature Park and also fell in love with some wildflowers and a momentarily glamorous insect. 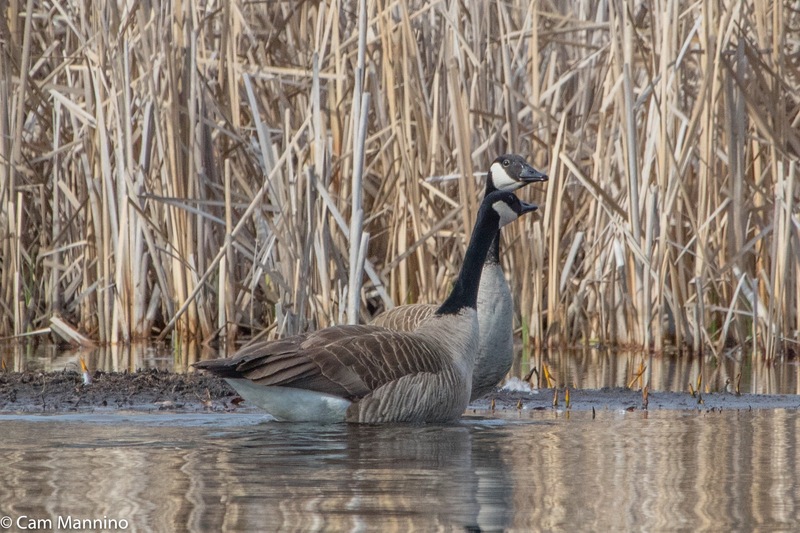 When I stepped out of my car during my first visit, a male Canada Goose (Branta canadensis) and his mate saw me and moved away from the floating dock. The female swam calmly to the west end of the lake while the male patrolled the center. The male Canada Goose keeping an eye on me from the center of the lake. He turned his head toward me as I reached the dock and kept me in sight all the time. It was a cold day with a strong north wind, unusual for late April. As I walked along the shore toward the east, I heard the male goose honking wildly and turned to see him making a bee-line straight toward me across the pond! When he reached the dock, he took to the air and flew at me, honking wildly, his wings snapping just above my head. Needless to say, I did not raise my camera for a photo! He dropped heavily into the water behind me and gave what the Stokes guide called “the head flip,” stretching his neck high, shaking his head from side to side and giving what Stokes calls “quiet grunts” indicating that the goose is apprehensive or disturbed. I was puzzled as to what I’d done to receive what was so clearly a threat. So after a few minutes, I moved back to the dock and finally noticed what should have been obvious before. A goose nest rested among the stalks on the island in the lake, lined with feathers from the female’s chest (a “brood patch”) and perhaps some cat-tail fluff. Silly me, I didn’t realize that the whole south side of the pond was this pair’s territory and they had started a family there! A quite obvious goose nest probably lined with some of the female’s breast feathers and perhaps some cat-tail fluff. 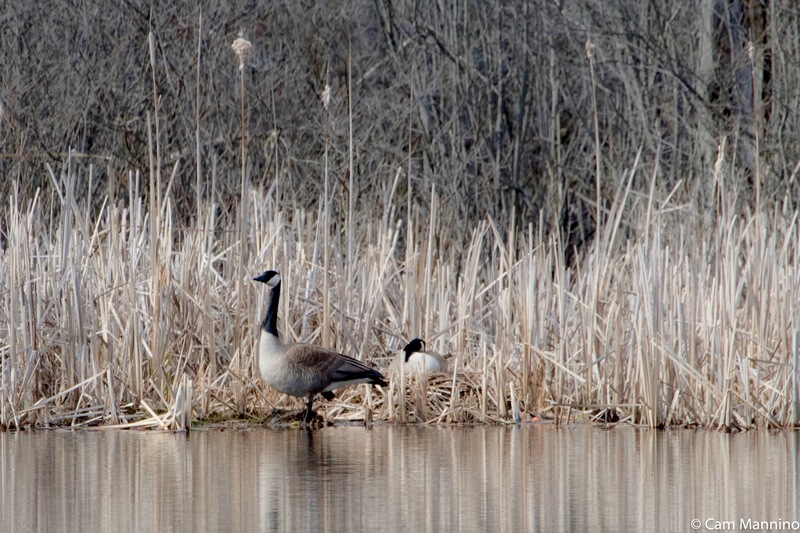 On the far side of the pond, a second pair of geese were already nesting. Periodically the first male would venture somewhat toward the second pair and the male of that pair would stand with his neck very straight and his body tilted slightly forward. If I understand the Stokes Guide correctly, he was making an “I’m aware of you” signal to the other male, indicating that he sensed a possible confrontation. The first male circled away each time. The male of a second pair raised his neck and head to indicate to the other male that he was approaching too close to his nest. 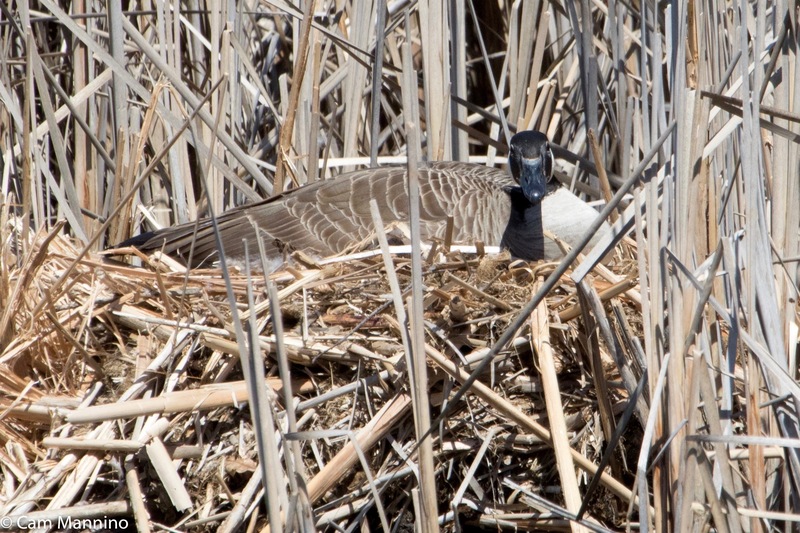 Later in that visit, the female goose of the first pair rejoined her mate near the nest. As she approached, they both began what Stokes calls a “greeting ceremony.” She would call softly “hink, hink” as she swam and he would respond almost simultaneously with his loud “A-honk!” When she reached him, she put her bill near his, almost tucking her head beneath his lower bill. The female joined the male and they did a bit of the greeting ceremony, accompanied by soft calls. The female placed her head right below the male’s during their greeting. Then to my amusement, they both turned in my direction and seemed to be scolding me loudly for having dared to get that close to their beautiful nest! Look at the male’s eye turned right toward me and the female facing me directly! It was just a reminder…. The two geese honk loudly while facing me, perhaps as warning to not get so close to their nest next time! On my next visit to the dock, it was the female who gave me the warning – a stern look as she sat on her nest. That neck position with a straight, lowered head aimed right at me is a threat pose. She remembered this possible trespasser with the camera! The female goose takes a threat pose from her nest on my second visit. She knows a trespasser when she sees one! On my third visit, she still kept an eye on me, but seemed more relaxed at my presence, just turning her head to let me know that I was seen. That extended wing may be creating a warm blanket for her eggs, if any, as well as for her. The nesting female was more relaxed on my third visit. A week later, I saw what I thought might be my first pair quietly feeding near the nest. Female geese leave the nest for up to an hour during incubation and these two were very close to the nest. It was a lovely warm day and the eggs, if there were any, were probably quite warm under the loose feathers and cat-tail down. 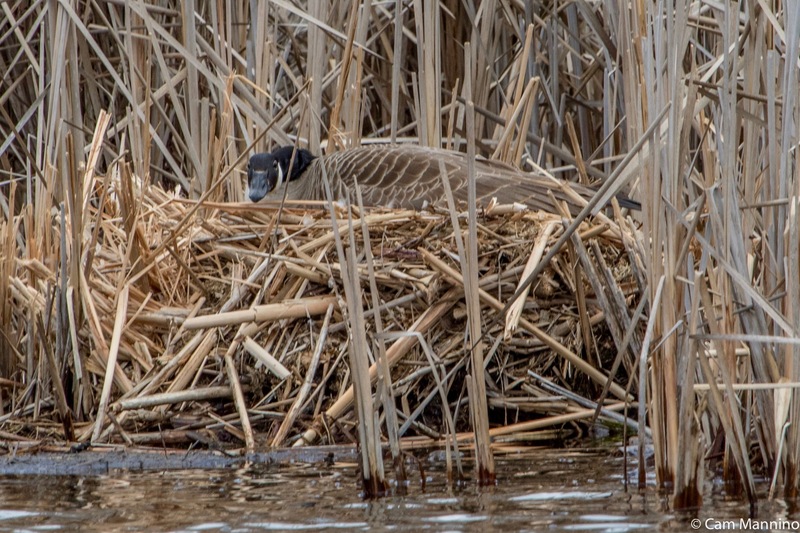 I also spotted a third nest at the west end of the lake with one goose standing over it and the female of the second pair on the north side was still sitting on her nest. 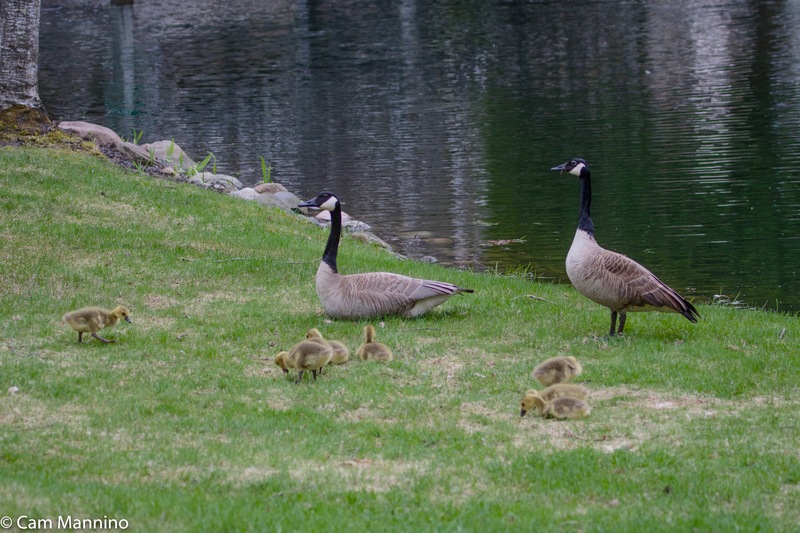 But the Canada Goose treat of the day was that, on my way home, I stopped to see two adult geese down the road at a residential pond, standing guard over seven little goslings calmly munching on the fresh green grass. On that third visit, I also got treated to a pair of very calm Hooded Mergansers (Lophodytes cucullatus) floating around the bend in the island not far from the female goose. I’ve always seen photos of male Hooded Mergansers with their hoods raised dramatically, as in this photo by inaturalist.org photographer, Liam O’Brien. The male at Lost Lake, however, seemed calm and collected. Through the veil of dry stalks, I was able to catch a quick shot of him. His relaxed crest lay in a slight droop at the back of his neck. The patterns of color on his body and head are so lovely and his bright, golden eye shone like a small gem in his velvety black head! 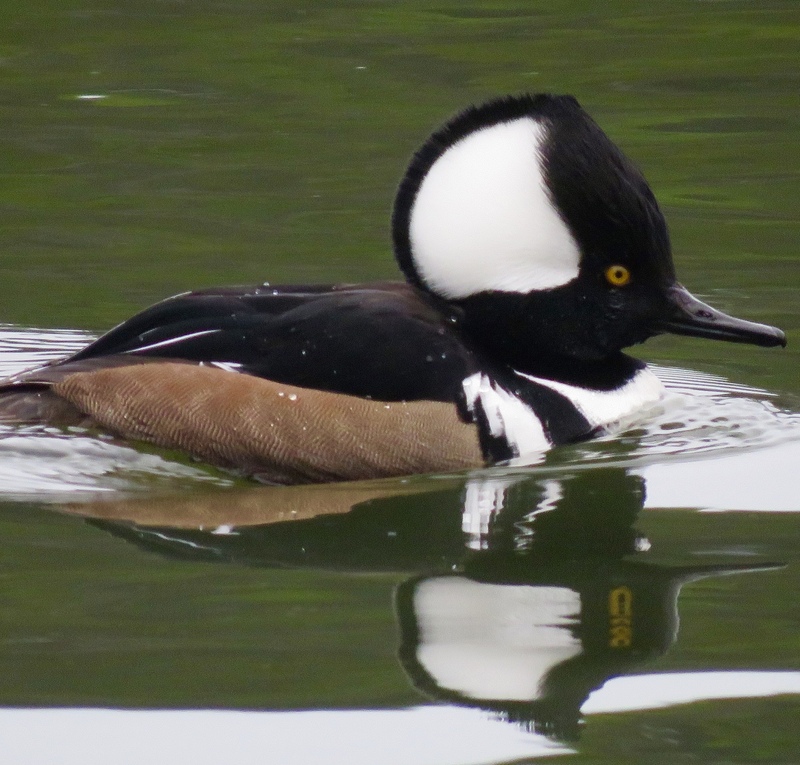 A male Hooded Merganser cruised Lost Lake in a relaxed mode, his dramatic crest a droop of feathers on the back of his neck. 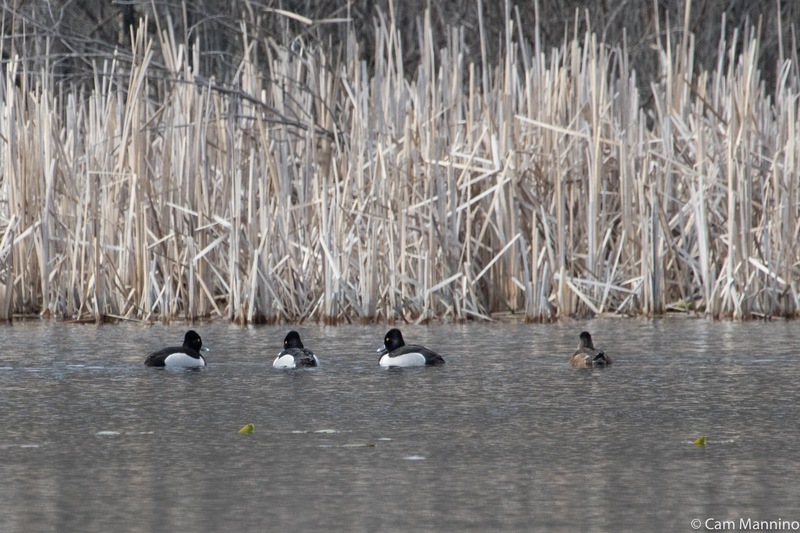 On the coldest days, the Ring-necked Ducks (Aythya collaris) on the far edge of the lake tucked their bills into their back feathers. I thought perhaps they were keeping a low profile against the icy north wind that drove quick, short waves across the pond. In this relaxed posture, they simply drifted with the wind. 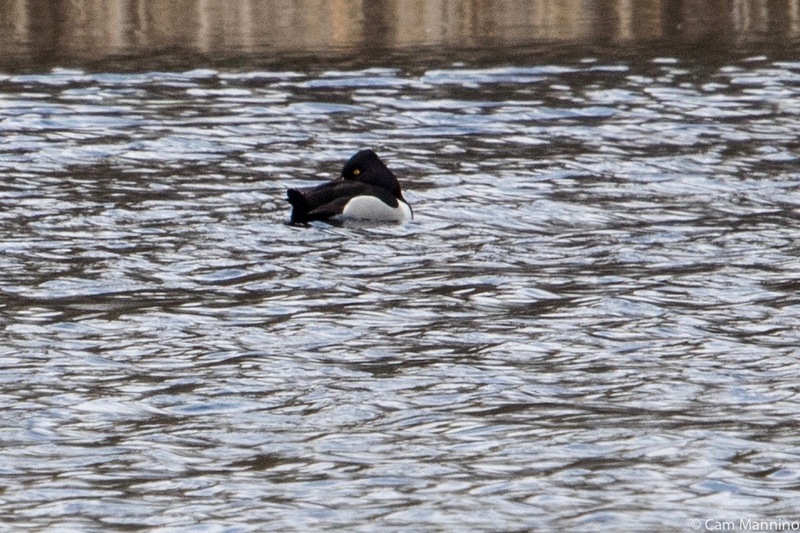 A Ring-necked Duck tucked his bill into his wing feathers, perhaps trying to cope with the icy wind. A gathering of Painted Turtles (Chrysemys picta marginata) sun-bathed on the log where I’d first seen the Mergansers. This large one looked particularly content, despite its perpetual grimace. 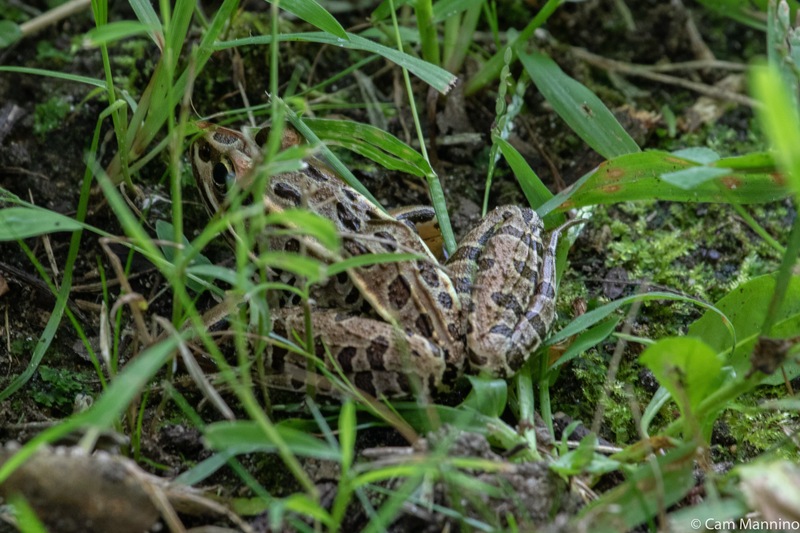 Nearby, I think I kept hearing the snoring call of the Northern Leopard Frog (Rana pipiens). It’s as low as the Wood Frog’s, but less continuous and truly, very much like a snore! My recording was much too distant because the Leopard Frogs quieted every time I approached! But you can listen to one at this Macaulay Library link . I didn’t know until this year that Leopard Frogs come out of hibernation from muddy lake bottoms in very early spring. I usually see them later in the spring or summer when they move into grassy areas. Here’s a picture of one a few summers back in just such an area at Bear Creek Nature Park. Snazzy spots, eh? Lost Lake is surrounded by the high, dry hills cloaked by an Oak-Pine Barren. Birds flit in and out of the trees that surround the lake and the woods beyond. 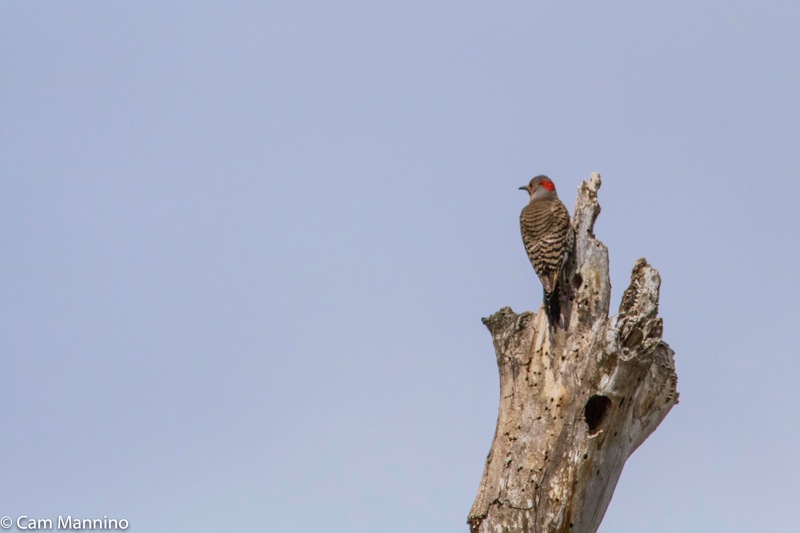 The rhythmic, insistent call of the Northern Flicker (Colaptes auratus) sounded from the very top of a snag near the lake one sunny afternoon. In the photo that accompanies my recording below, you can see why he was once called the Yellow-shafted Flicker. 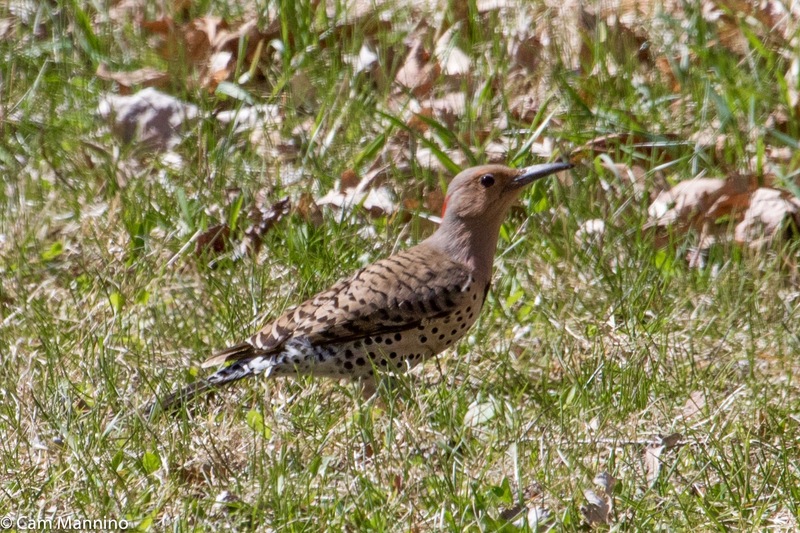 Nearby, in the grassy area just west of the caretakers’ house, a female Flicker was paying close attention! Male flickers have a black “mustache” on either side of their bill; females don’t. Flickers are actually woodpeckers, though they spend a lot of time on the ground probing for their favorite food, ants. 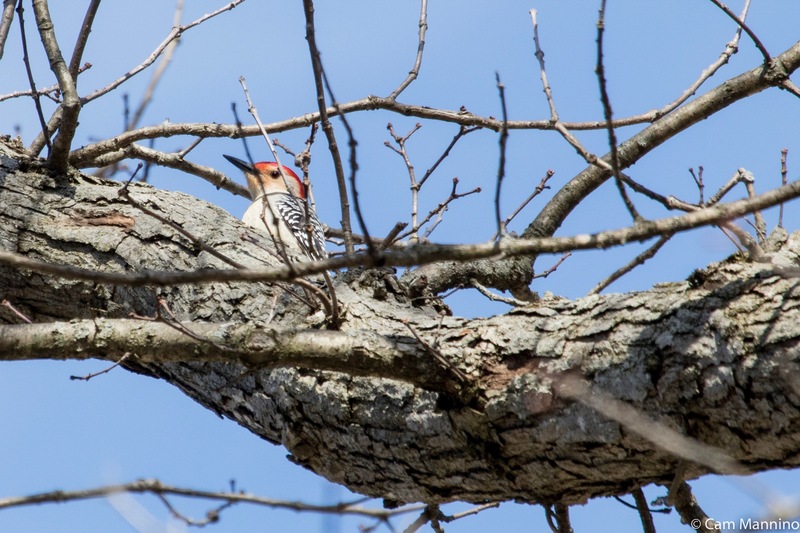 In fact, woodpeckers of several kinds busied themselves foraging on snags all over Lost Lake.That’s one of the reasons bird lovers leave dead trees standing in their woods when they can. They provide places to eat and nest for woodpeckers. 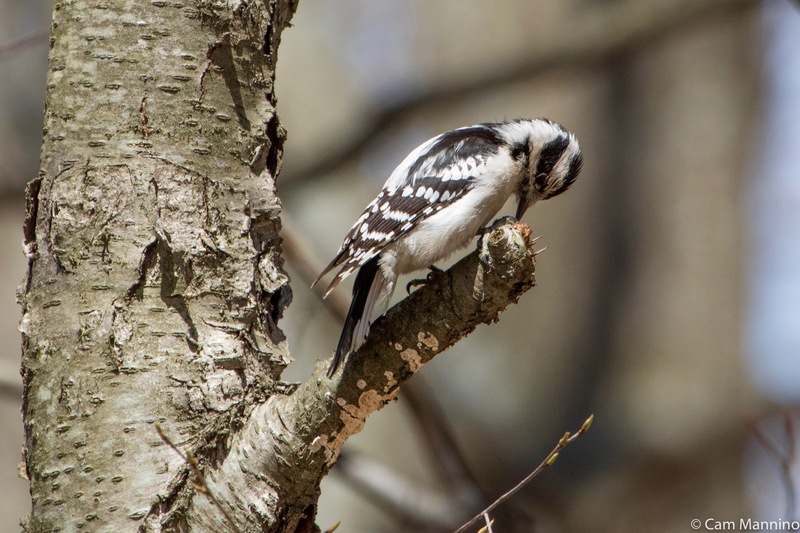 Here a female Downy Woodpecker (Picoides pubescens) drills with great concentration on a dead limb, probably searching for beetle larvae. The little Downy Woodpecker female is intent on finding some food in a dead limb. A Red-bellied Woodpecker (Melanerpes carolinus) hitched quickly from branch to branch, probably looking for a similar meal, though he may also have been establishing a territory since he periodically let forth with his kwirrrr call. 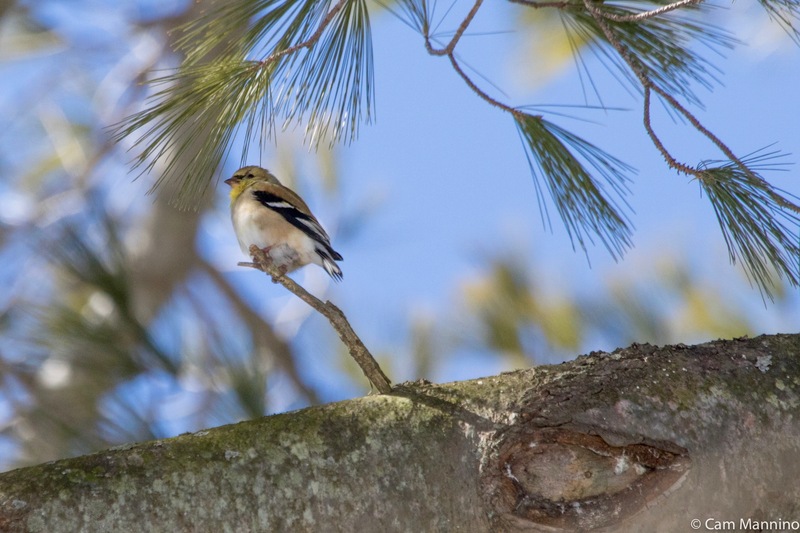 In the White Pines (Pinus strobus) near the caretakers’ house, the cheery, tweeting call of the American Goldfinch (Spinus tristis) can be heard almost any day! I imagine they frequent the family’s thistle feeder all day long! An American Goldfinch sits in the White Pines near the caretakers’ house enjoying their thistle feeder. 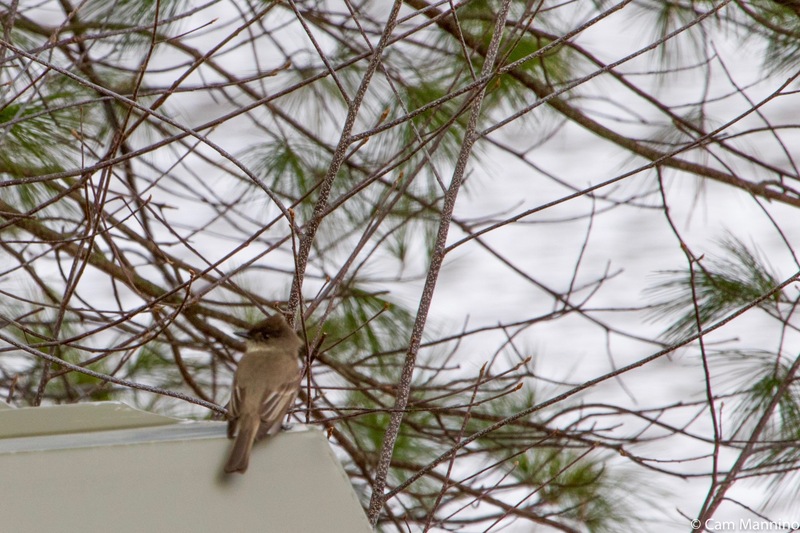 Occasionally, I’d see an Eastern Phoebe (Sayornis phoebe) in the area, sometimes on a low limb or sitting on the upturned boat near the shore. It’s always darting down near the water’s edge, probably seeking out insects, since it’s a flycatcher. A Phoebe resting on the upturned boat before darting down to feed at the shore. The Eastern Kingbird on takeoff! The Kingbird resting near the pond with a bit of nesting material in its beak. 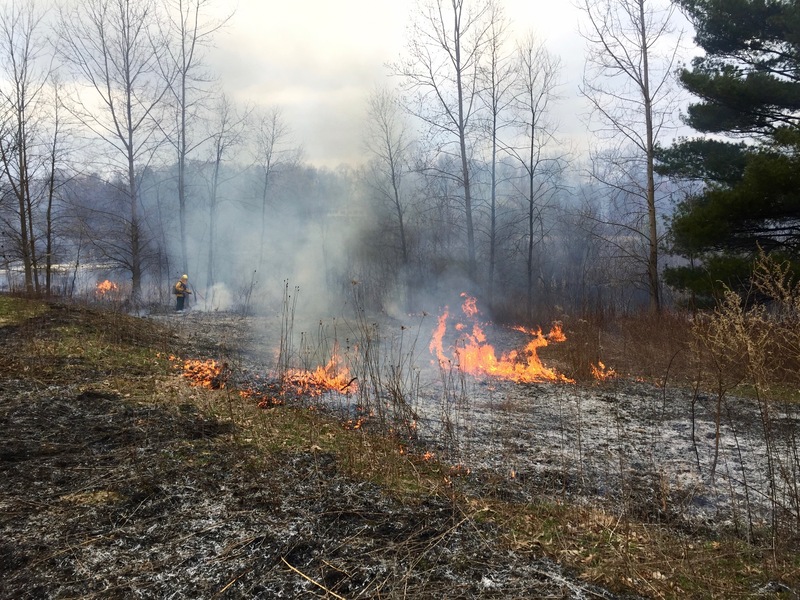 A prescribed burn on April 27 nourished and warmed the native plants in Lost Lake’s natural areas. The native plants of Lost Lake are a hardy bunch when it comes to fire! 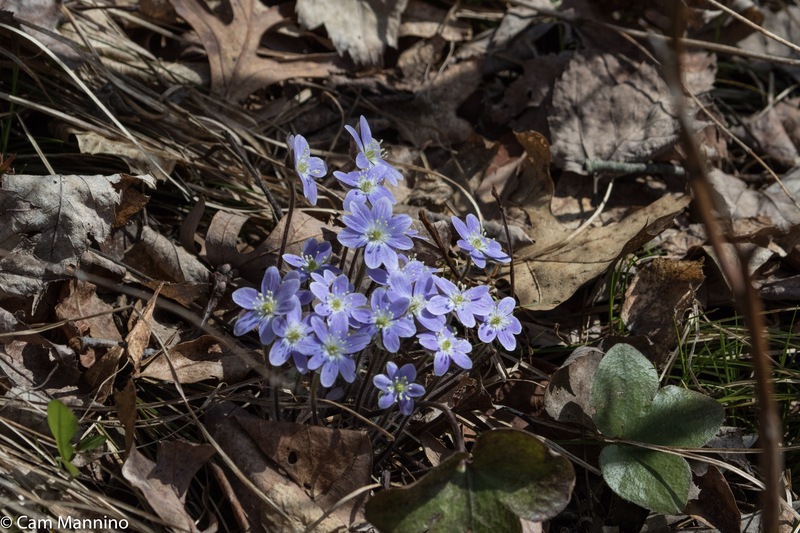 Shortly before a Lost Lake prescribed burn took place on April 27, I spotted two clusters of a classic spring flower, the native Round-lobed Hepatica (Hepatica americana). Some were along the trail to the Oak-Pine Barrens and the ones below were just at the edge of the grassy area west of the caretakers’ house. A classic of early spring, Round-lobed Hepatica bloomed at the edge of the grassy area west of the caretakers’ house. The fire crew was alerted to the presence of these little beauties and did their best to avoid them, leaving the ones in the photo above completely untouched, and singeing the ones along the trail, but leaving some leaves and blossoms. The surprise was that when I came back a week after the fire, the hepatica which was untouched by fire had disappeared – perhaps finished off by warming temperatures or by a grazing deer. But the singed ones along the trail had made a comeback! These fire-adapted plants were producing new leaves and blossoms already on the blackened forest floor! The nutrients from the last year’s dry stalks had been released back into the soil by the fire and the blackened soil was nicely warmed again – so up they came for a second chance in the sun! Hepatica flowers bloom again after the prescribed burn. A hardy little hepatica rises from the blackened soil. 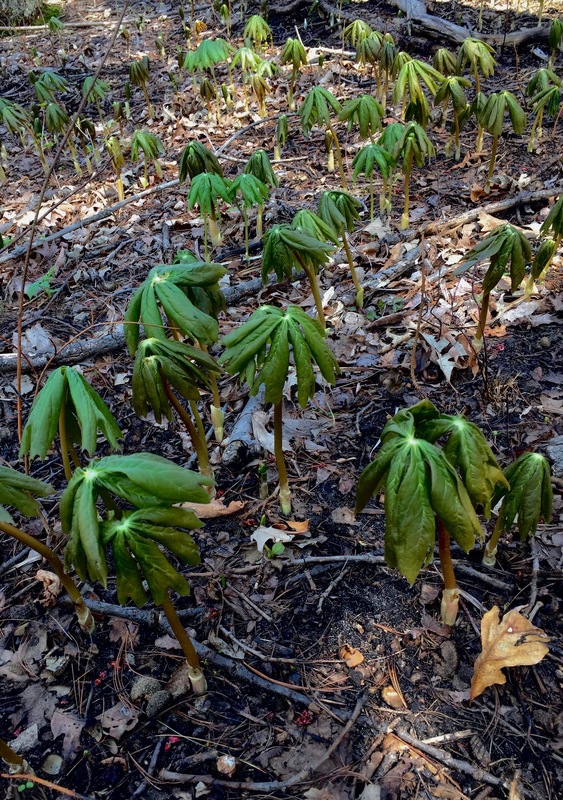 Likewise, down near the burned shore of the lake, under the trees, a huge patch of another native plant, May Apples (Podophyllum peltatum) emerged from the darkened soil. Their umbrella-like leaves were just beginning to open in the dappled light. The native May-apples, also fire-adapted, emerged from the blackened soil to bloom in shade near the pond. And of course the fire couldn’t reach the leaves of the Fragrant Water Lilies (Nymphaea odorata) rising from beneath the water near the edge of the lake. I never knew just how the lily pad took shape. Evidently they come up vertically like a wide blade of green and then eventually lay back on the water surface, as the various stages in the photo below suggest. I’m looking forward to the summer blossoms that bloom in the morning. 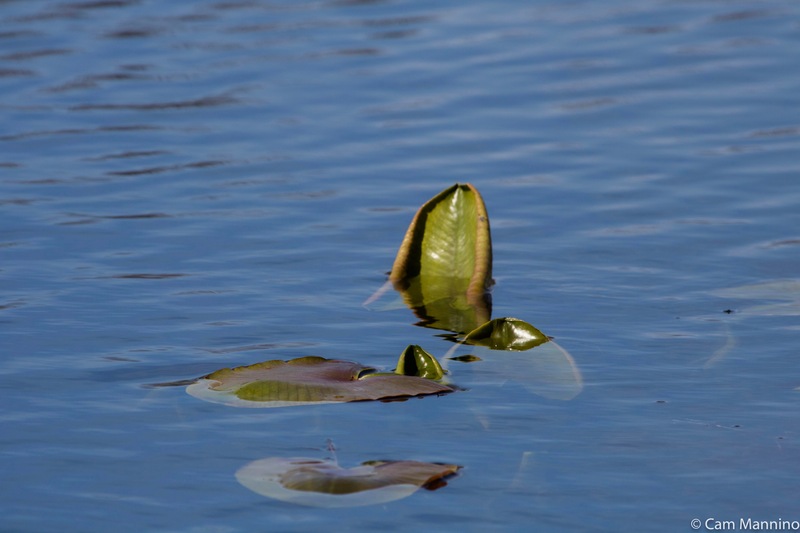 Fragrant Water Lily leaves rise from beneath the water and eventually lay back to become the lily pad. 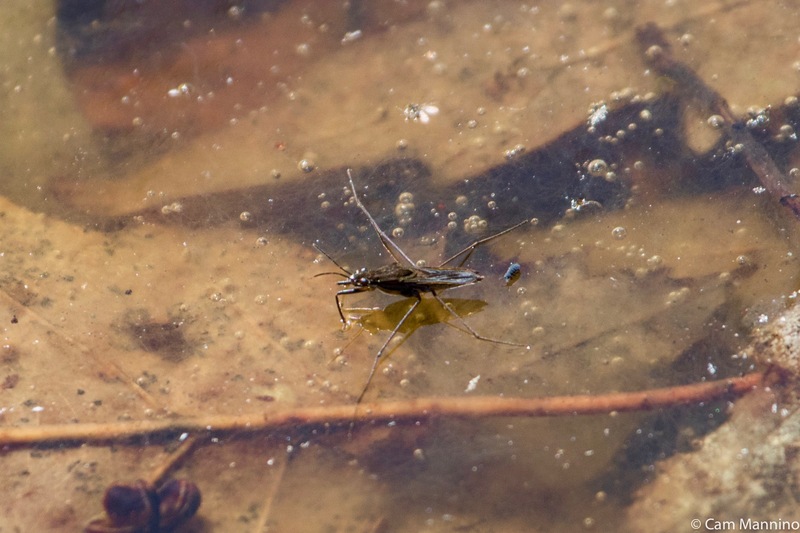 A tiny Water-Strider (fam. Gerridae) rowed across the surface of a wetland at the foot of the slope in the Oak-Pine Barrens. This little creature literally walks on water! In the shadows, it was easier to see its body and legs covered in thousands of tiny hairs which keep its body dry and light enough to perch above the water as it forages. Its long, flexible, strong legs distribute its body weight evenly so it can move easily across the surface of the water – hence its irreverent other name, the Jesus bug! It steers using those long back legs and pierces its prey with the claws on the middle of its front leg! But suddenly, when this amazing little creature moved into the sunlight, a small reflection of the sun shone like a star where each leg met the waterline. 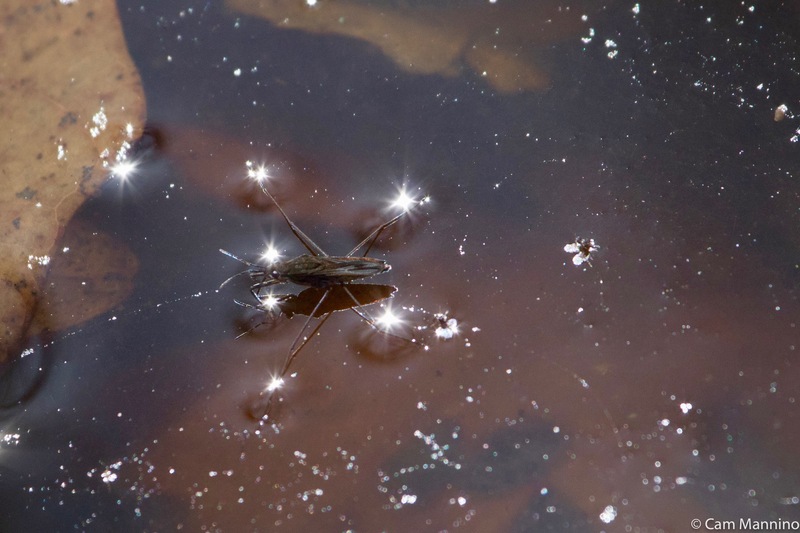 I was delighted and immediately decided that the Water Strider could be the “star-studded finale” on the blog this week! Seeing this tiny rower motor about the surface of a wetland, listening to the snap of a goose’s wings right over my head, or coming upon little lavender flower faces peering up at me from the grass – those moments are epiphanies for me. They illuminate the reality that despite the presence of nature’s most invasive species, i.e. we humans! – nature endlessly tries to adapt and survive, even if it means walking on the water, challenging a trespasser or springing out of burned earth. Surely such skills, daring, resilience and sheer beauty deserve our loyalty, protection and thoughtful stewardship. Footnote: My sources for information, besides Oakland Township's Stewardship Manager Ben VanderWeide, are as follows: inaturalist.org;Allaboutbirds.org, the website of the Cornell Ornithology Lab at Cornell University; maccaulaylibrary.org; Wikipedia; Herbarium of the University of Michigan at michiganflora.net; A Guide to Bird Behavior Volume 1 by Donald W. Stokes,and other sources as cited in the text. 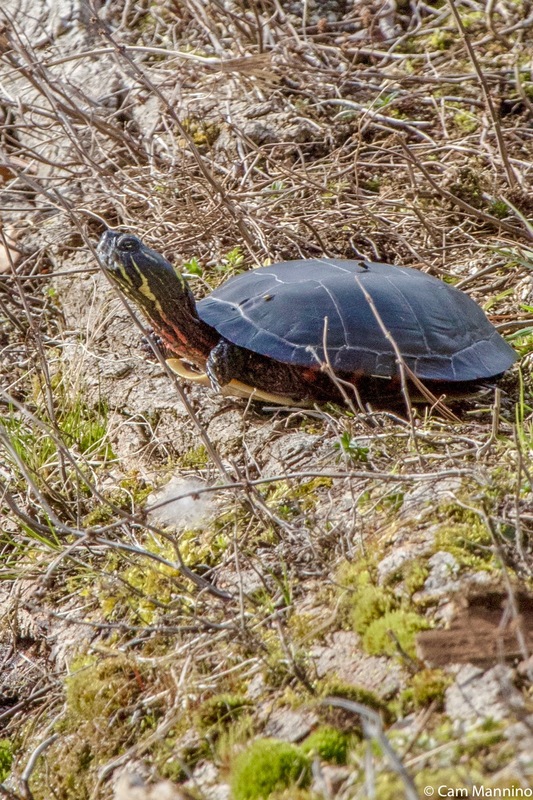 The last two weeks at Bear Creek gifted me with some exciting moments – seeing previously unseen birds, witnessing unusual nesting behavior, watching a turtle struggling to bury her eggs and being surprised by a little butterfly I hadn’t seen for years. So though the blog just visited Bear Creek two weeks ago, I wanted to share the bounty I’m enjoying before the season changes much. Unusual Birds and the Usual Ones Doing Interesting Things! A bit earlier that morning, we saw an unusual bird at the other end of the size spectrum. 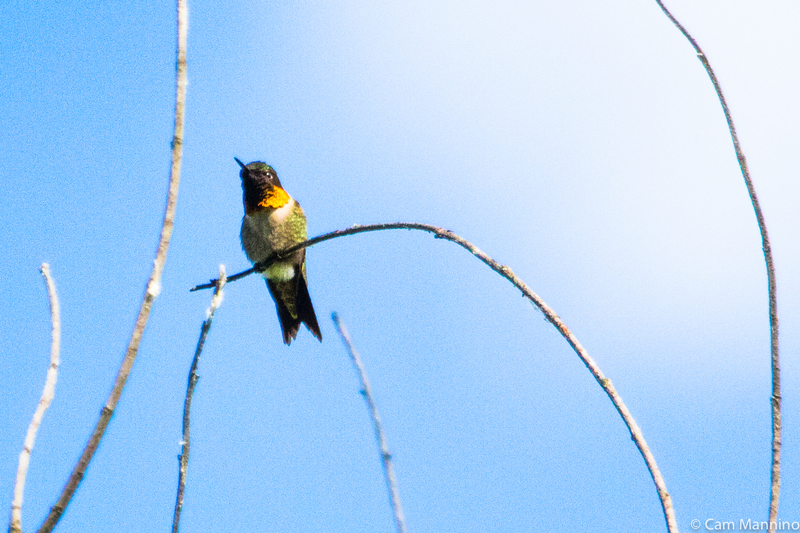 A male Ruby-throated Hummingbird (Archilochus colubris) perched high on a snag behind the Center Pond and turned his iridescent green back to the morning sun. We saw a quick orange flash at his throat but I missed it. The Stokes Guide to Bird Behavior (Vol. I) indicates that males’ throats look brown or black if the light doesn’t hit their necks just right. When I returned on a late afternoon, there he was on the same snag – but this time the afternoon sun caught the edge of his throat which shone gold rather than ruby red. He’s not the most glamorous hummer, but I’m glad I got to see a bit of his gleam. This male hummingbird’s bright throat only shone for a second in the morning sun, so I settled for the light in his eye and his iridescent green back. 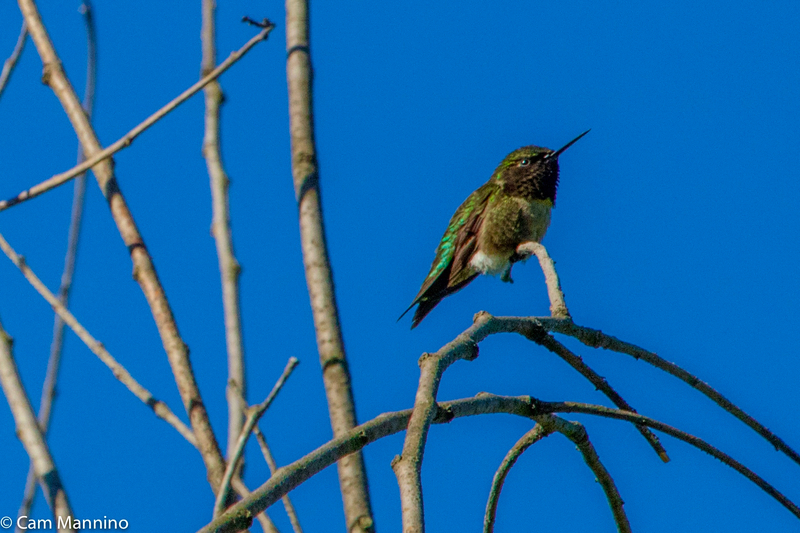 The same male hummer’s throat shone gold in the late afternoon sun. 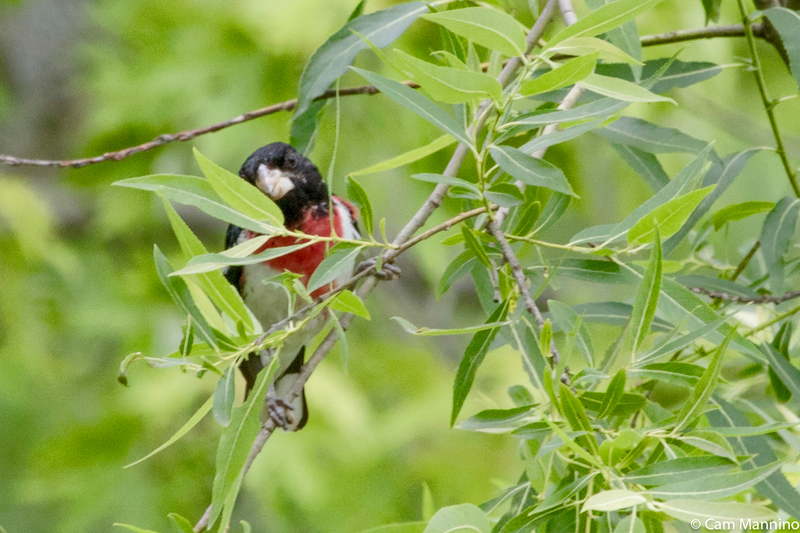 Near the Center Pond, the birders also discovered the nest of a Rose-breasted Grosbeak (Pheucticus ludovicianus) – with the male sitting calmly, tending the eggs or nestlings. Occasionally, he even sang his lovely tune as he waited patiently. I’d read in the Stokes Guides that male Grosbeaks sometime take on this responsibility, but I’d never seen it. On three separate visits, the male was the only one on this nest – though the female may have relieved him at other times. So, Happy Father’s Day to this dedicated Grosbeak dad! In a willow to the right of the deck in the Center Pond is a beautiful nest. It’s cleverly attached between two vertical branches about 20 feet up, ingeniously woven and quite large – maybe 9 inches long. During my first 3 visits, only the female’s black tail cocked behind her was visible from the observation deck. Finally one afternoon, I waded into the grass at the pond’s edge and caught sight of her hindquarters as she fed her young. 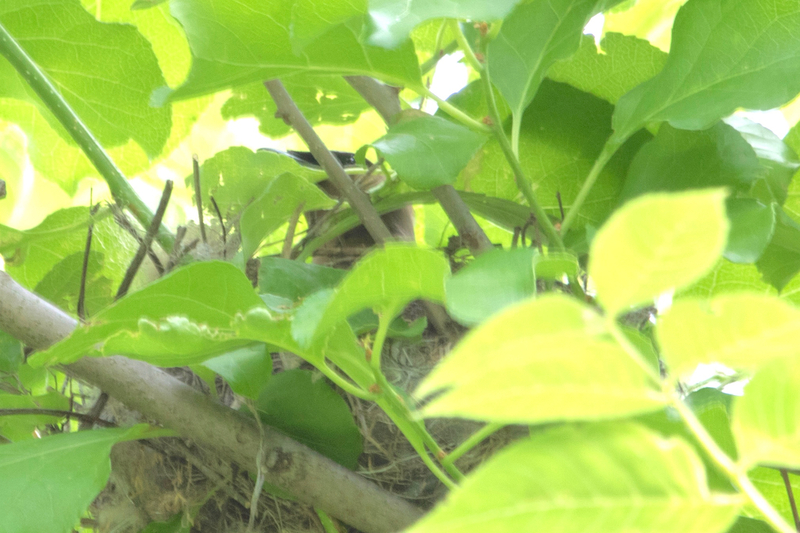 And then, I saw a fledgling’s head just above the edge of the nest. 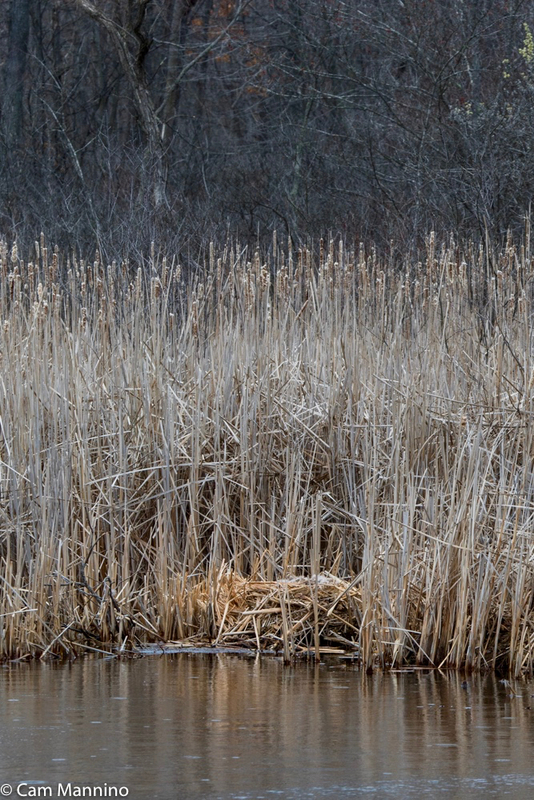 Ah, this nest was constructed by a female Red-winged Blackbird (Agelaius phoeniceus) – a somewhat eccentric one since Red-wings normally build close to the water and weave their nests among cat-tails or reeds. She’s quite an architect! The location of this elaborate nest makes it nearly invisible and unreachable by predators. Clever mama Red-wing! Two nests appeared high in a tree on the Walnut Lane. The barely visible, masked eye of the female Cedar Waxwing (Bombycilla cedrorum) peeked through the leaves that camouflaged the first nest spotted by the birders. Since she sat there quietly every time I visited, I’ve included a photo of a Waxwing from a previous year so you’ll remember how elegant this conscientious mother bird truly is! Only the masked eye of the female Cedar Waxwing shows above the edge of her cleverly hidden nest along the Walnut Lane. An adult Cedar Waxwing. The two red dots on the wing gave it its name. 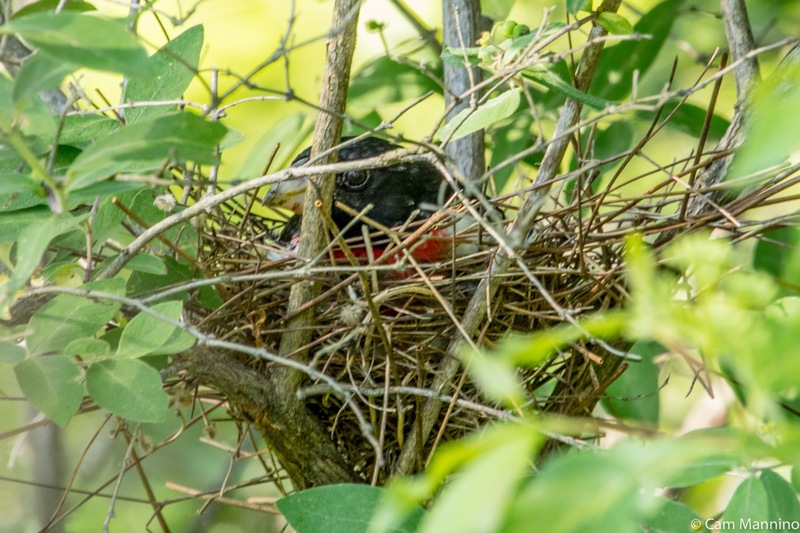 Across the Walnut Lane, the birders also discovered the nest of a female Eastern Kingbird (Tyrannus tyrannus) who spent several days building her gauzy, somewhat more loosely constructed nest. She proudly stood above it a few days later as it neared completion. The female Kingbird constructs the nest and keeps the male off it until the eggs hatch. Then both parents feed the nestlings. But even during the egg phase, the male stays on a branch nearby to defend the territory for his mate and young. Another good provider, a tiny male Yellow Warbler (Setophaga petechia) brought a bright green caterpillar to feed his nestlings or mate. In between feeding trips, he’d let loose with his proud song, “Sweet, sweet, I’m a little sweet.” Impressive dad who can bring home the bugs, singing all the while! Bet the female warbler was as impressed as I was. 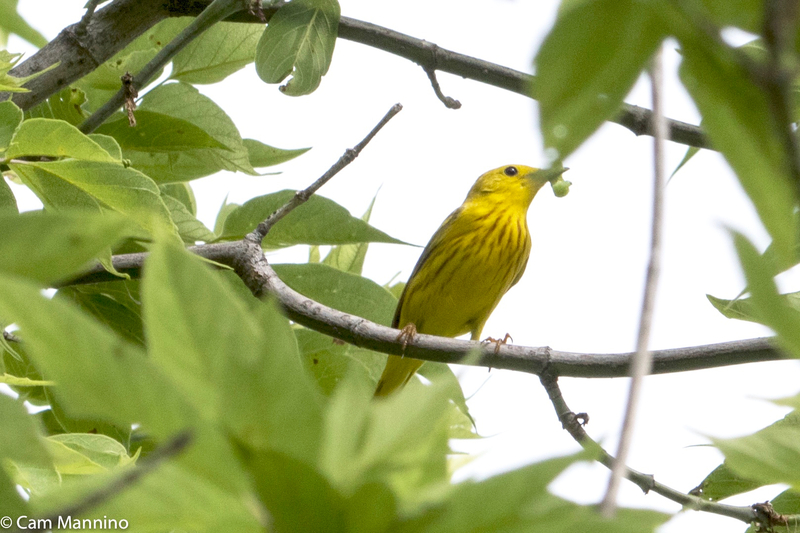 A Yellow Warbler feeds his mate or young a bright green caterpillar and sings in between feedings. 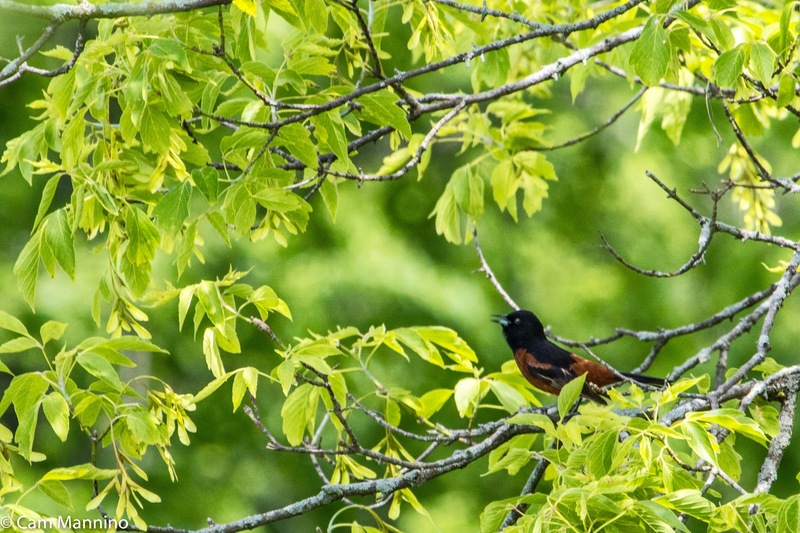 An Orchard Oriole male (Icterus spurius) serenaded us from a small tree in the middle of a meadow. His long, melodious song sounded much like the third song recorded at this link. 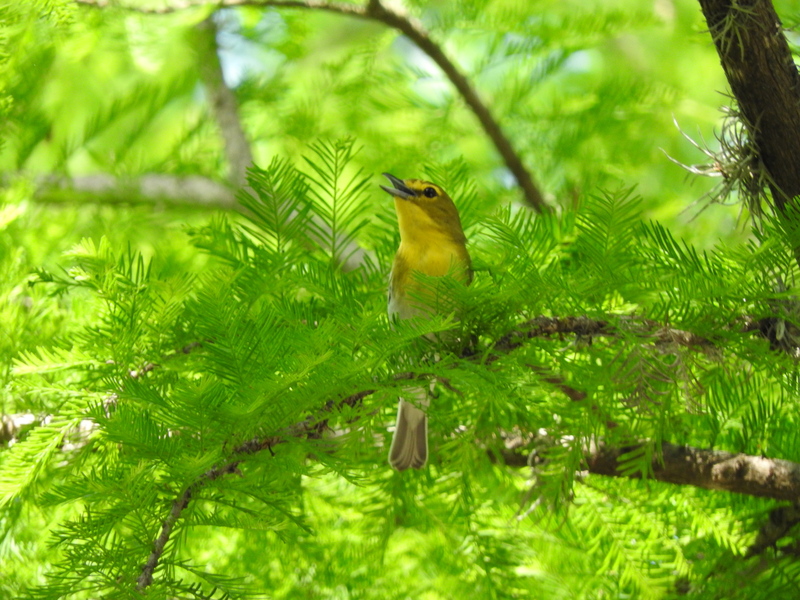 A few Orchard Orioles seem to come to Bear Creek each year – but they migrate south by mid-July. So keep an eye out and an ear cocked soon in the meadows to the east of the Walnut Lane! An invisible bird, high up in the tree tops, repeated its melodious warble continuously one warm morning. 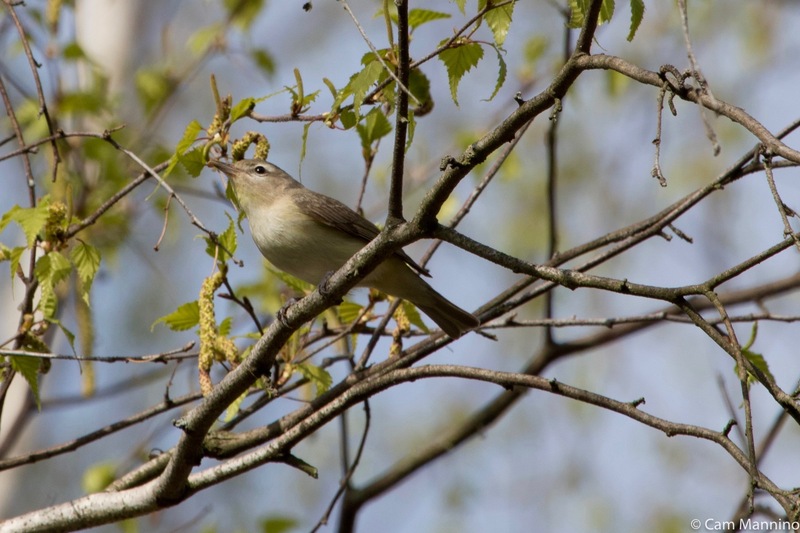 I’ve never seen a Warbling Vireo (Vireo gilvus); they rarely come down from the heights. But fortunately, a great photographer from the iNaturalist website, Steven Mlodinow, has seen one and generously allows others to borrow his photo. 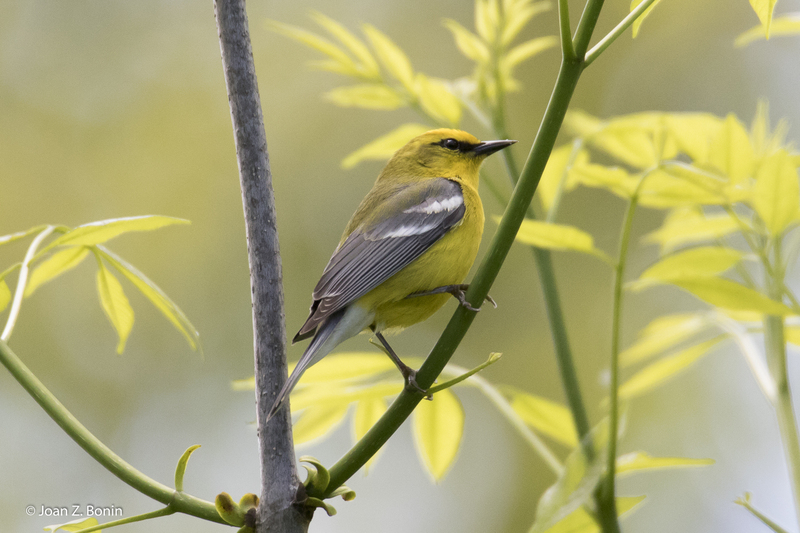 Listen for this warbler’s rich melody all summer long, but don’t be surprised if you never spot this elusive summer resident. At the northeast corner of the Center Pond, a young Painted Turtle (Chrysemys picta) hurried to cover her eggs one hot afternoon. 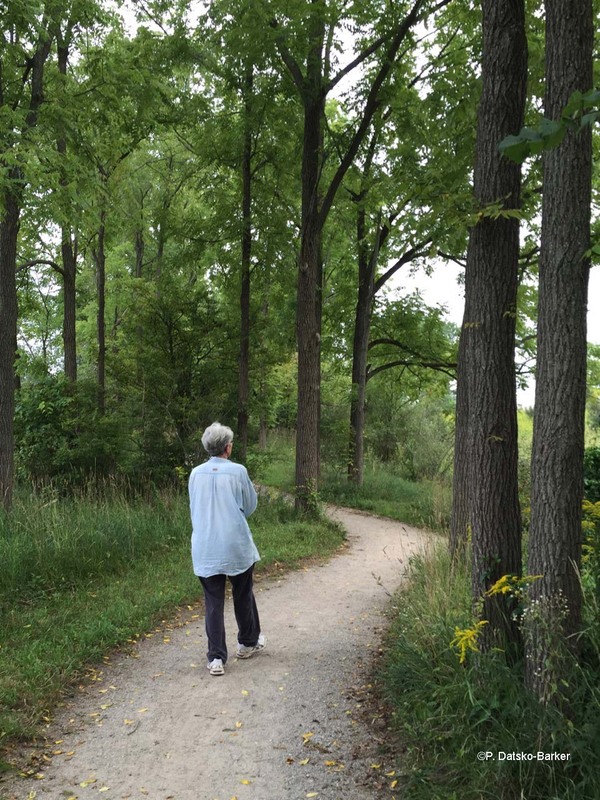 She’s found a likely spot where Ben had cleared away invasive shrubs a couple of years ago. As you’ll see in the video below, she work really hard with her back legs to get the dirt to move. She’d no doubt have preferred sandier soil! But she was determined to see the job done! 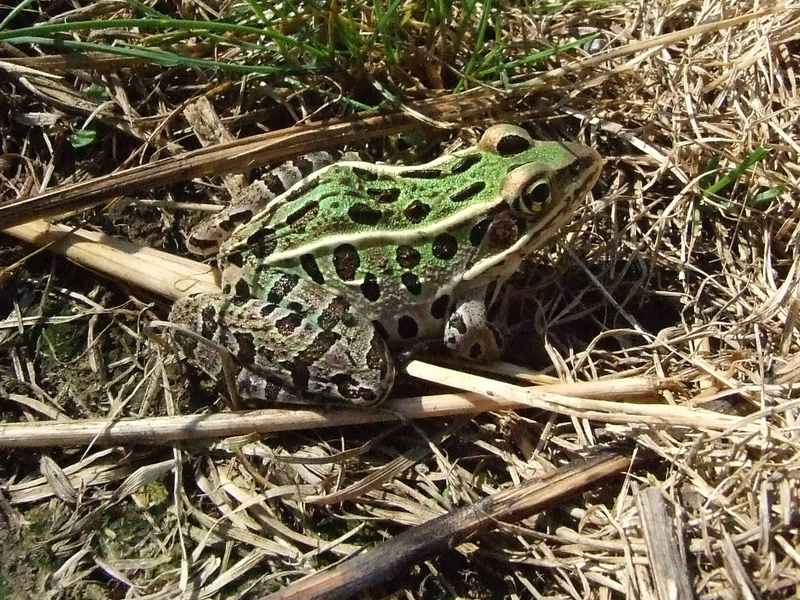 I’ve seen Northern Leopard Frogs (Lithobates pipiens) periodically at Cranberry Lake but never one at Bear Creek. But hearing their snoring call near a wetland, I waded into tall grass and found this one, hiding among the greenery. Glad to know this beautiful frog is at Bear Creek, too. 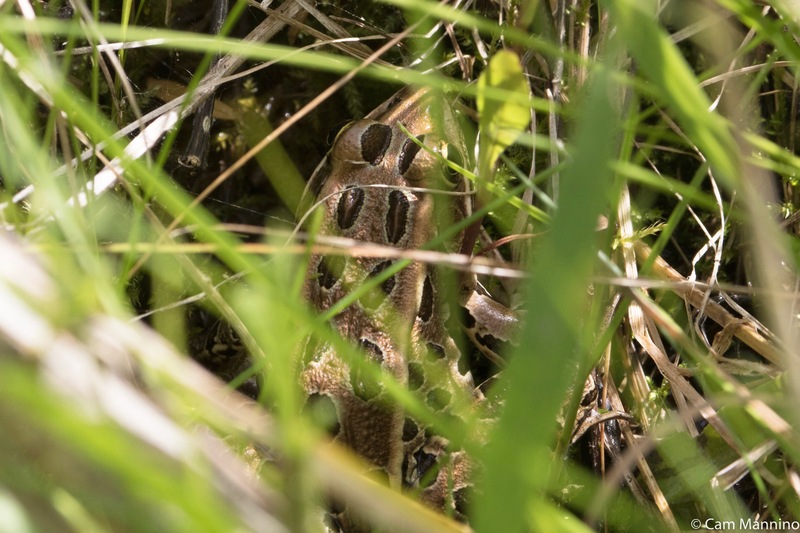 A Leopard Frog hiding in tall grass near a wetland. 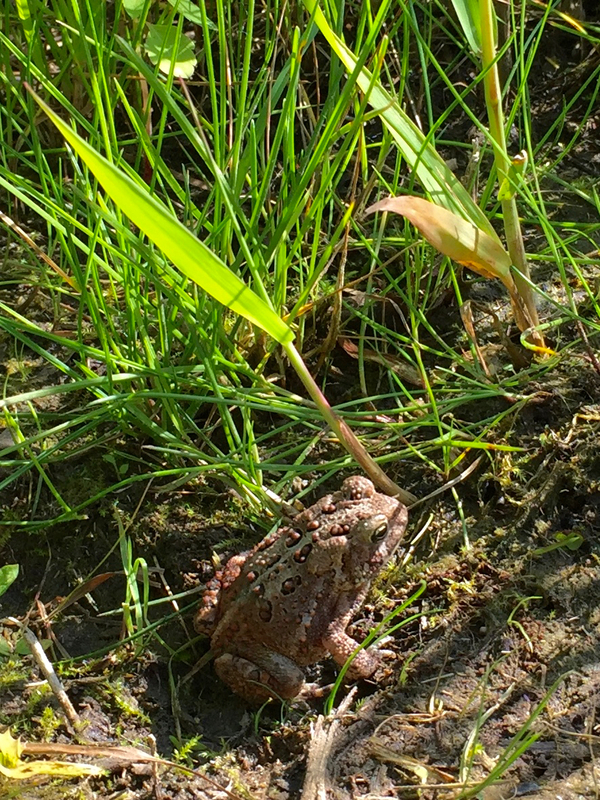 Ben noticed an Eastern American Toad (Anaxyrus americanus) toad on the path one afternoon when we went to look at nests. Normally, I only see brown toads, but Wikipedia informs me that “The color and pattern is somewhat variable, especially for the females. Skin color can change depending on habitat colors, humidity, stress, and temperature…Some toads of this subspecies have a more pervasive red and deep brown color, many with red warts on their bodies.” So this little toad is probably female and the red description fits her pretty well. I wonder if the unusually hot temperatures had an effect on her appearance? Hard to tell. 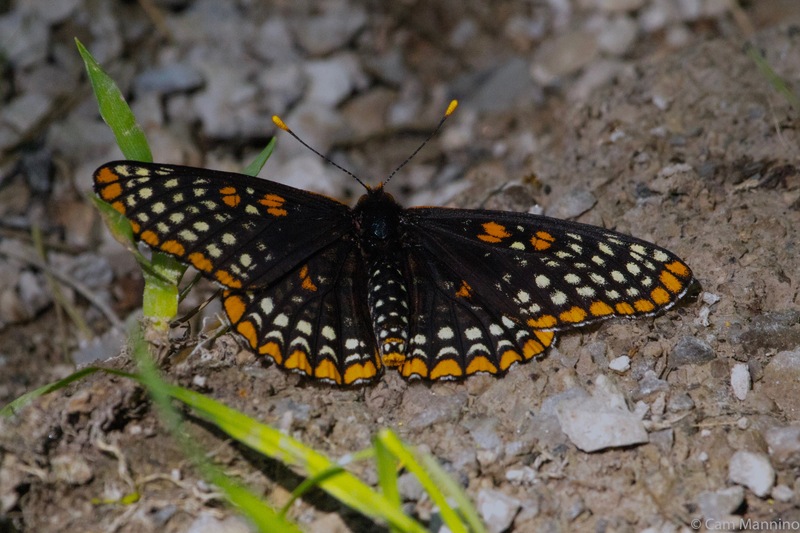 Next year, I’ll be looking for the boldly patterned Baltimore Checkerspot butterflies (Euphydryas phaeton) on June 11 or 12. I’ve only seen them on those two dates, 6 years apart! This year, four of them fluttered at a spot in the trail where water runs under the path – a place I’ve often seen other small butterflies feeding on minerals left by the water. 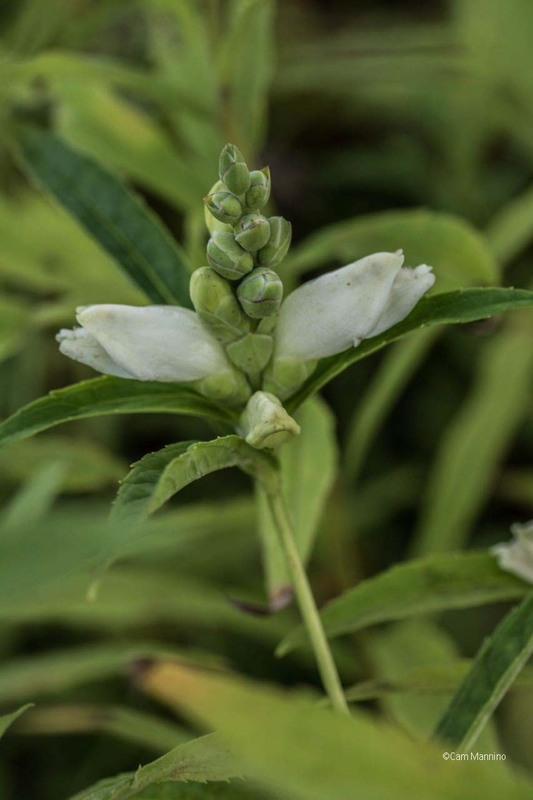 Later in the summer, watch for the communal caterpillar webs of these small butterflies (about 2.5 inches) on the host wildflower Turtlehead (Chelone glabra) where these butterflies lay their eggs during the summer and where the caterpillars first feed. Interestingly, in the fall, Baltimore Checkerspot caterpillars wrap themselves in leaf litter, overwinter and finish developing in the spring. This seems to be a big year for them – so keep an eye out if you see a small, dark butterfly at your feet. The Baltimore Checkerspot overwinters as a caterpillar. 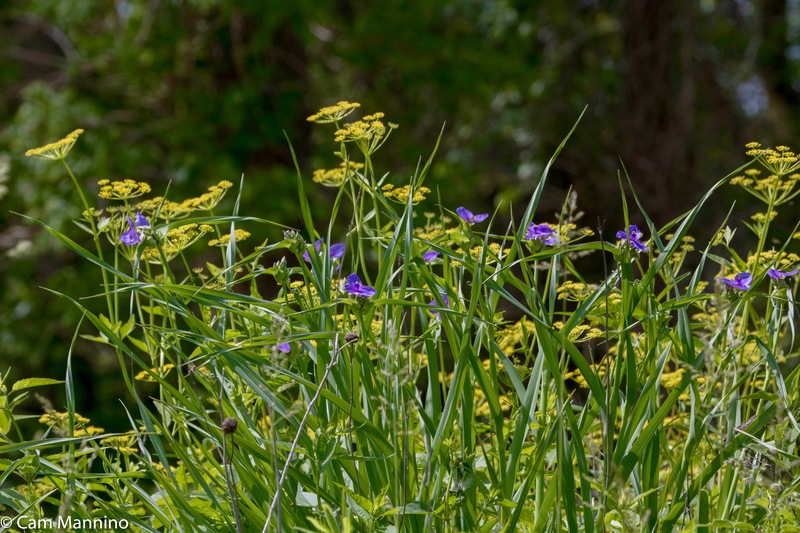 Different species of dragonflies seem to appear each week to dance among the budding wildflowers and over the pond. The dramatic, yet quite common Twelve-spotted Skimmer (Libellula pulchella) did indeed skim over the tops of grasses in the Eastern Meadow this week. 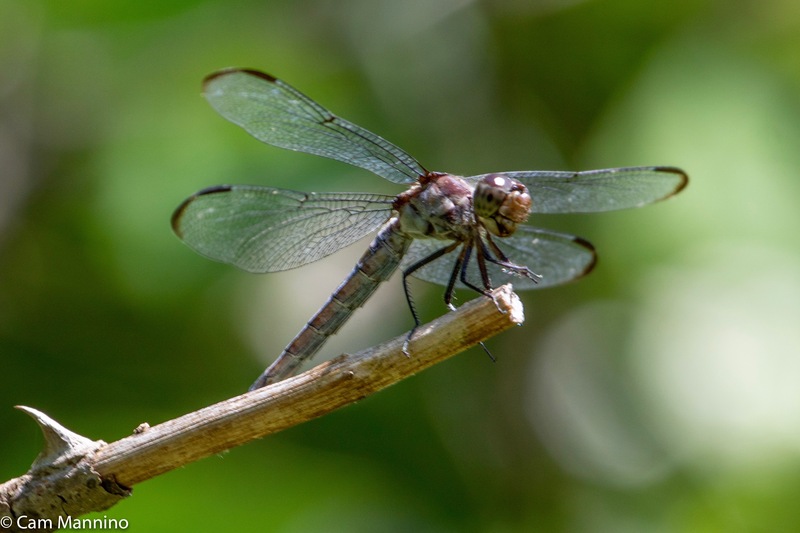 Dragonflies often land, fly, and then come back to the same dry stalk – so if you miss one in your binoculars the first time, wait a moment and you’ll probably see it in the same place again! A bright green Eastern Pondhawk (Erythemis simplicicollis) dragonfly clung to a grass stem on the western slope. If it’s a male, it will gradually turn blue over the summer. If a female, it will remain green. Probably this one is newly emerged since it’s hunting in a meadow. When it’s ready to mate, it will rendezvous with others at the Center Pond. 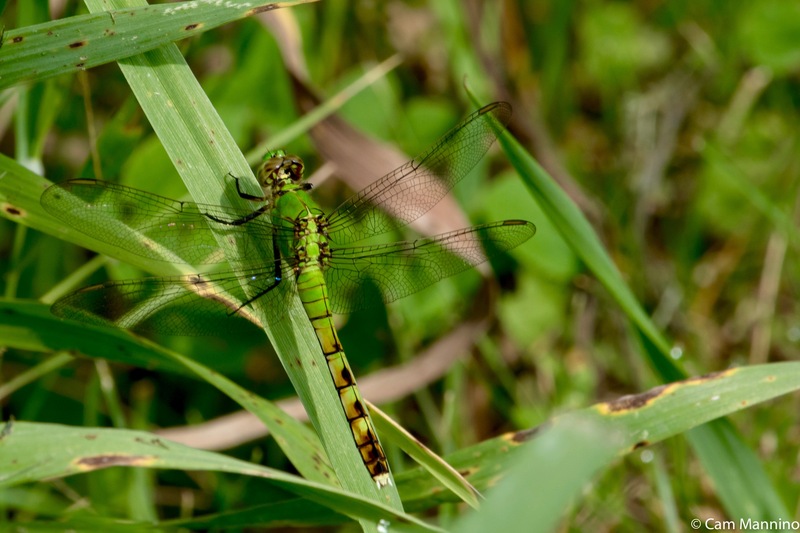 This Eastern Pondhawk is still in the meadow but will go to the pond when it’s time to mate. A small Dot-tailed Whiteface (Leucorrhinia intacta) dragonfly posed for a face-on selfie at the Playground Pond before continuing its quest to consume as many mosquitoes, flies and other small insects as possible before the day is out. Love its cartoon-like face and the one yellow dot on its tail that give it its name. 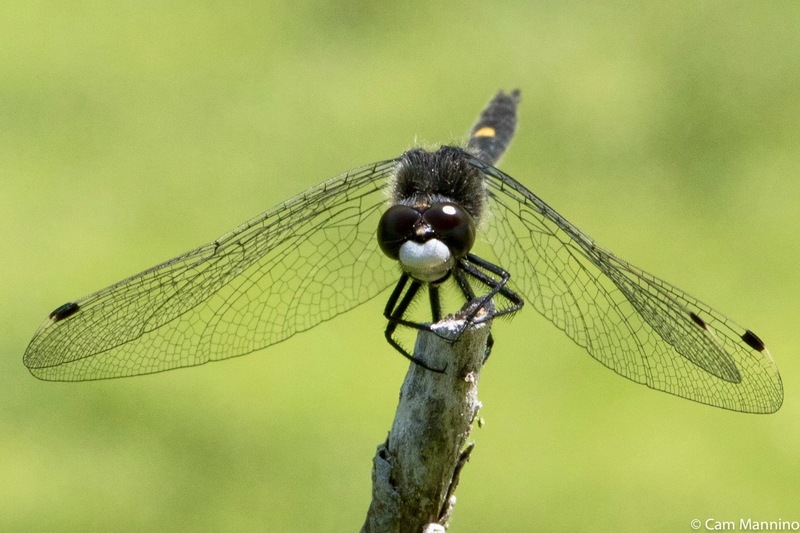 Easy to see why this is called a Dot-tailed Whiteface dragonfly, eh? Pollinators are busy all over the park, feeding and carrying the pollen that will bring us next year’s blooms. This may look like a European Honey Bee (Apis mellifera) but Honey Bees are fuzzy all over and this one just isn’t. So it’s more likely to be a Dronefly (Eristalis tenax), a type of Hoverfly (family Syrphidae), which uses its pattern, slight fuzziness and loud hum to mimic male Honey Bees as a way of protecting against predators. Droneflies cannot sting, but a passing dragonfly probably doesn’t take a chance! This dronefly (a kind of hoverfly) mimicks a bee’s appearance and hum for protection. I noticed what looked at first like a tiny wasp on this umbel of a native Nannyberry bush (Viburnum lentago) near the Center Pond. But after a bit of research in Pollinators of Native Plants by Heather Holm, I’m going to guess it’s a female Leaf-cutter Bee (family Megachilidae). It has a wasp-y pattern and shape and it’s collecting pollen on its abdomen and on the top of its back leg (look at those jodhpurs!). Leaf-cutters cut small, neat circles out of leaves, hence the name. They then roll up a single fertilized egg and a chunk of pollen in each circle, forming a solitary, cigar-shaped nest which is placed in a hole in the soil, wood or other structures. Such an unusual nest! I’ve always loved walking alone in the township parks. 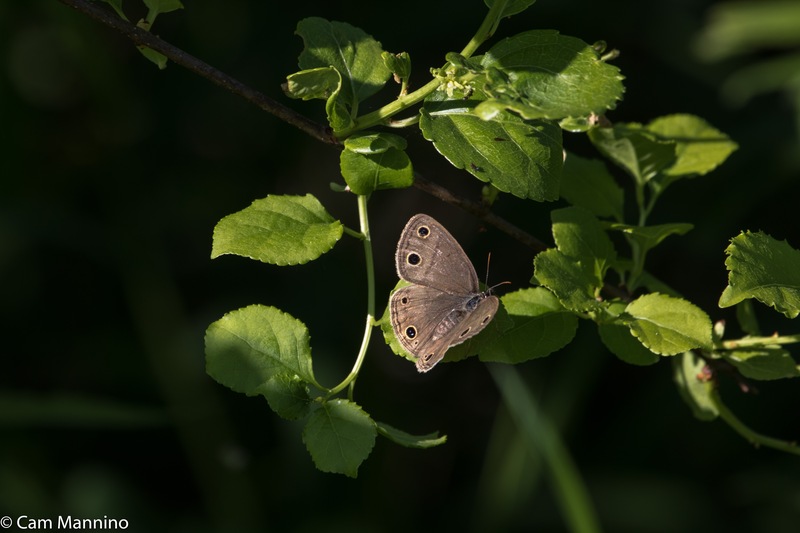 I can listen to birdsong, stop to look at something tiny like the Little Wood Satyr butterfly below, or enjoy the fresh scents of wood, greenery, the earth after a rain in silence. Solitary walks are contemplative. Footnote: My sources for information, besides Oakland Township's Stewardship Manager Ben VanderWeide, are as follows: Pollinators of Native Plants by Heather Holm; Stokes Nature Guides: A Guide to Bird Behavior Volumes 1-3; Allaboutbirds.org, the website of the Cornell Ornithology Lab at Cornell University; Wikipedia;  Herbarium of the University of Michigan at michiganflora.net; various Michigan Field Guides by Stan Tekiela; other sites as cited in the text.